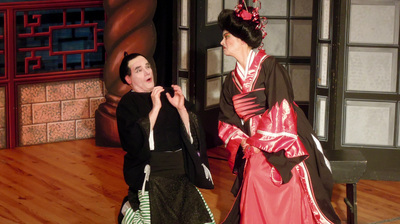 Nanki-Poo is in love with Yum-Yum. But there is just one snag. 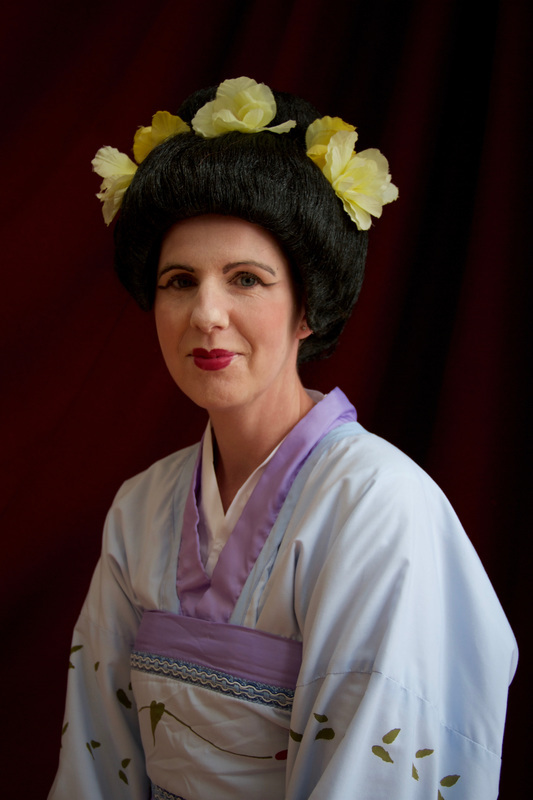 She's betrothed to Ko-Ko, the new Lord High Executioner, and Ko-Ko needs to find someone to execute – chop chop! Otherwise, it's his own neck on the block. 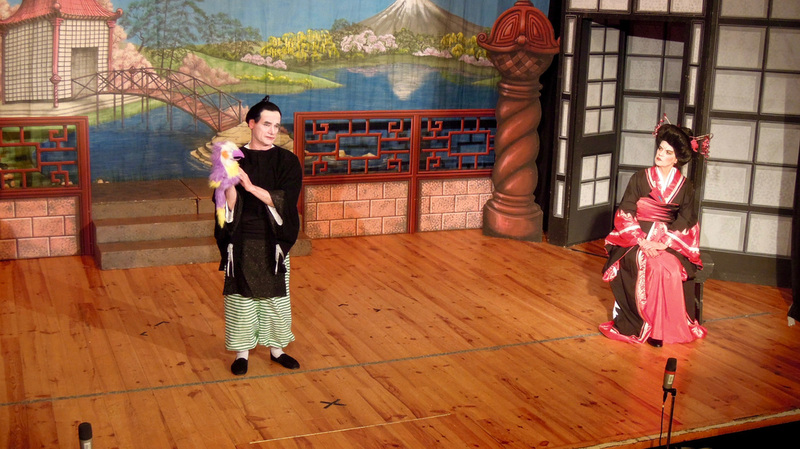 Well, well, well, you should have come to one of our performances to find out what happened. 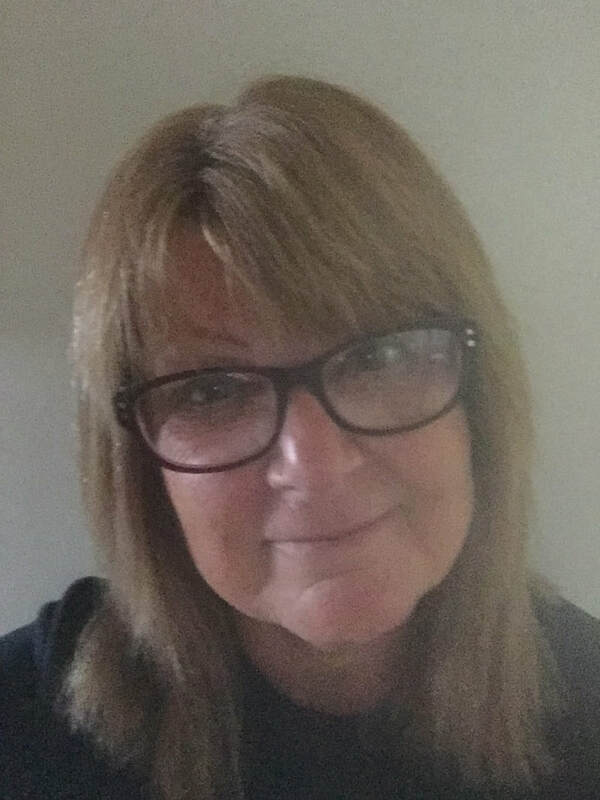 She says,”This has been my first time directing IMOG and I can honestly say that I have never had so much fun at rehearsals. 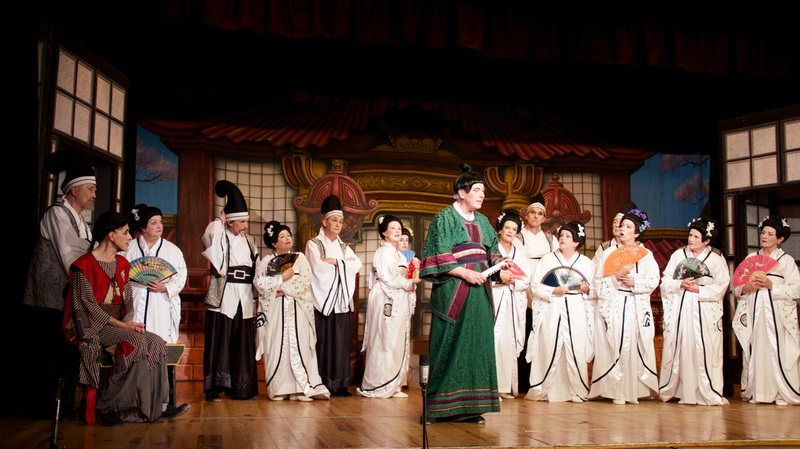 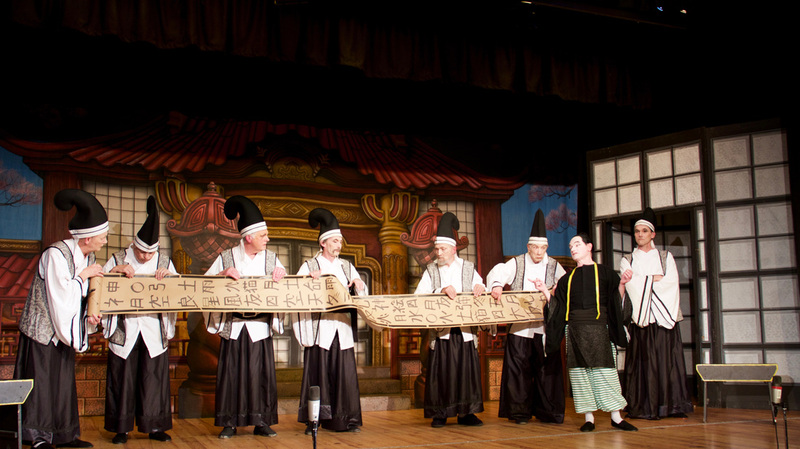 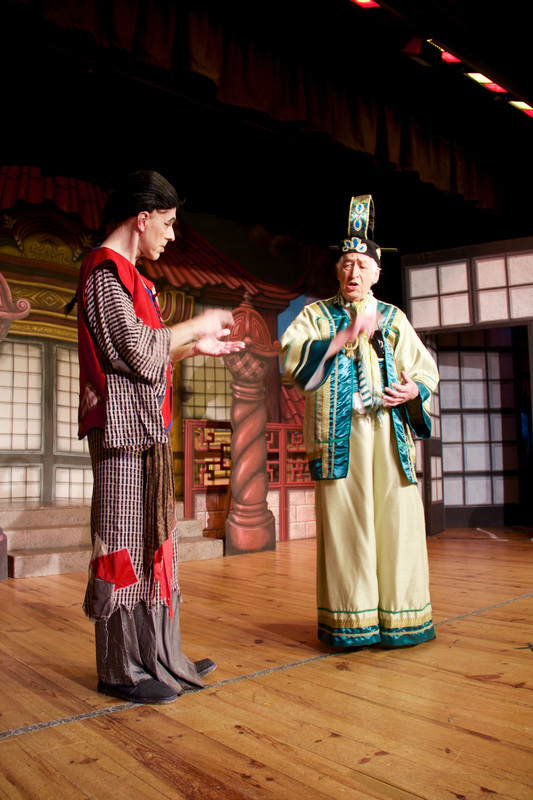 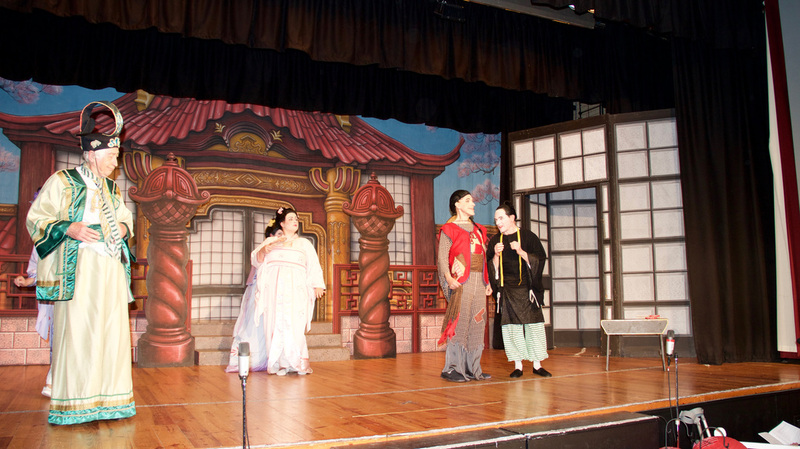 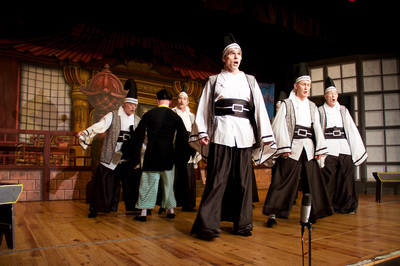 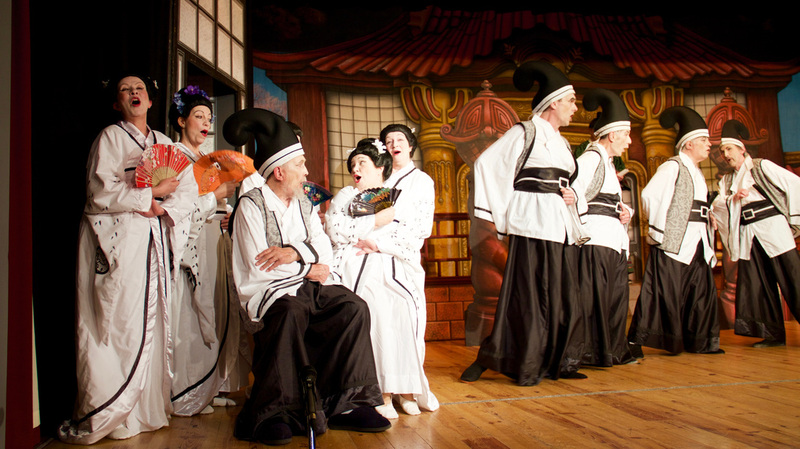 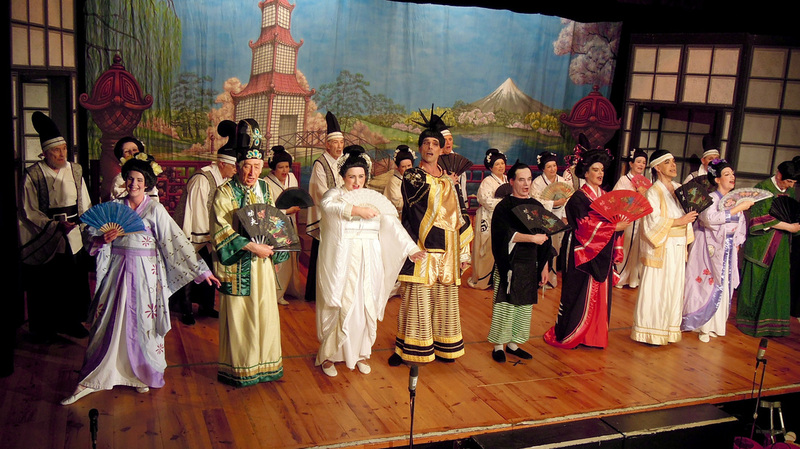 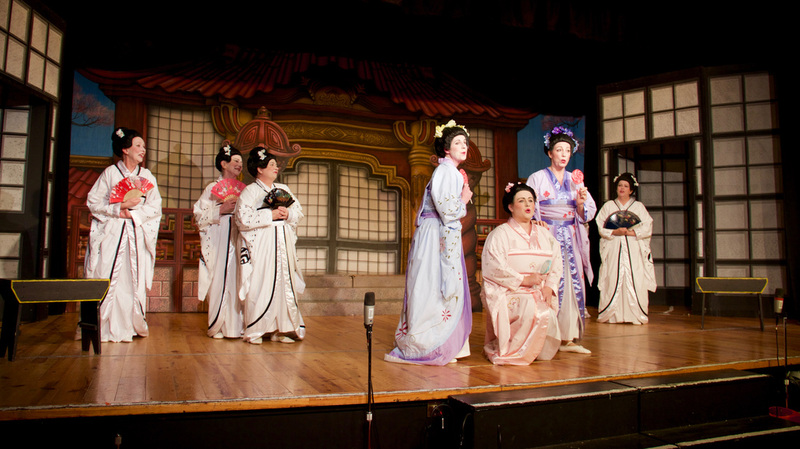 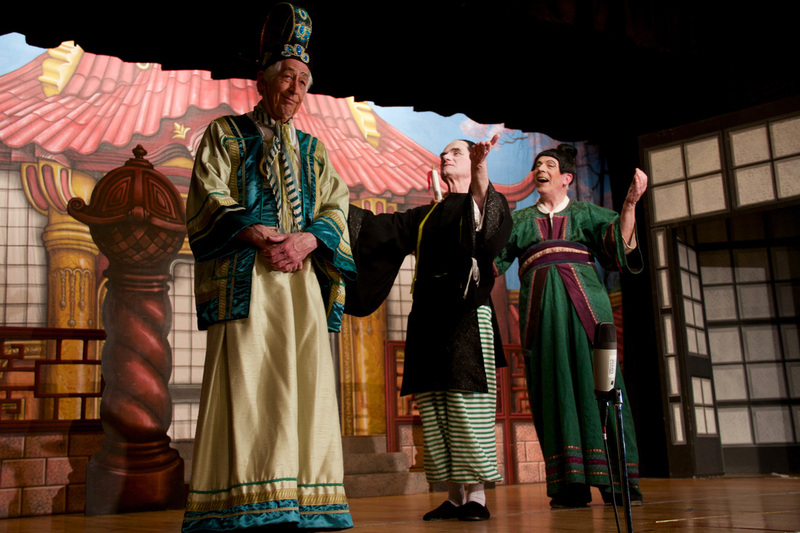 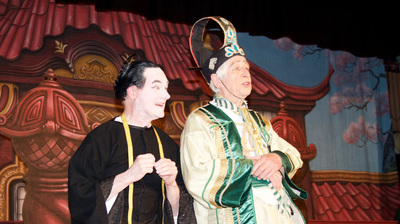 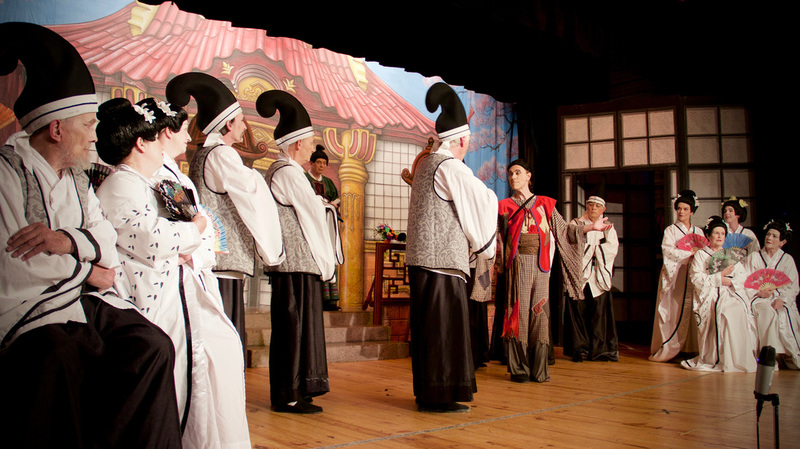 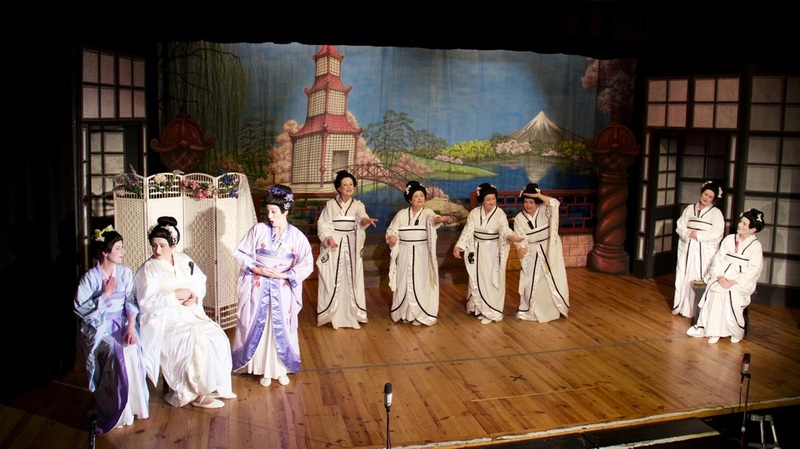 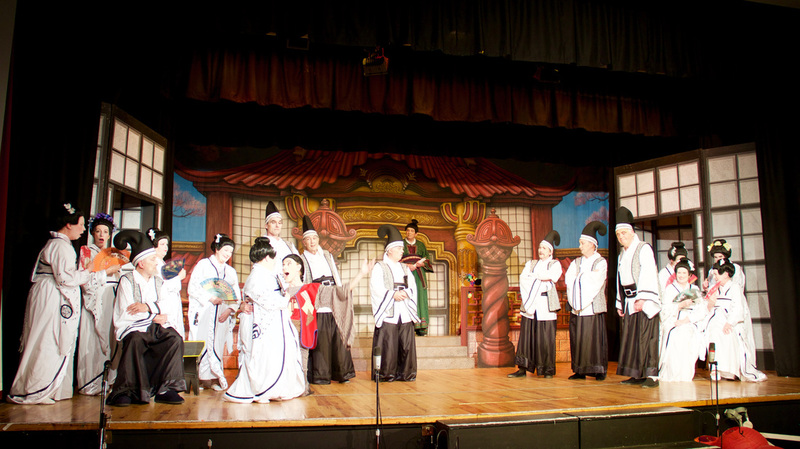 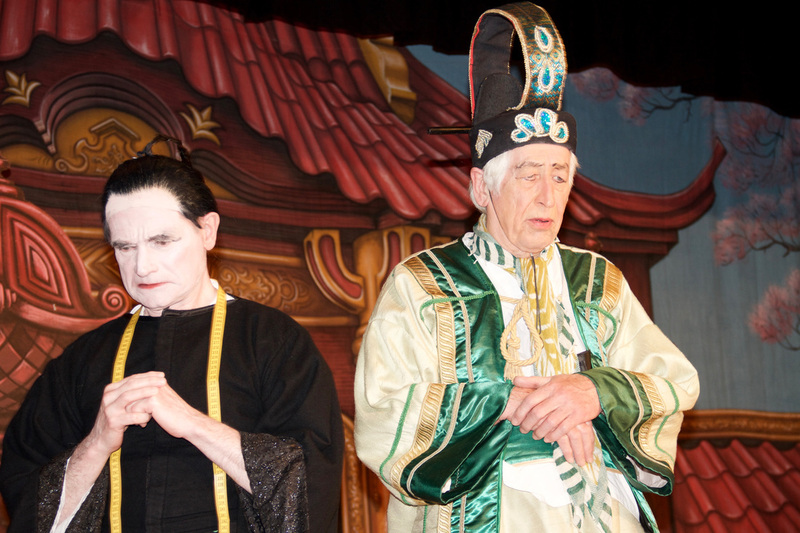 The wonderful talents of the IMOG members and the capable talents of the committee and stage crew, made it an easy job to stage this Gilbert and Sullivan musical. 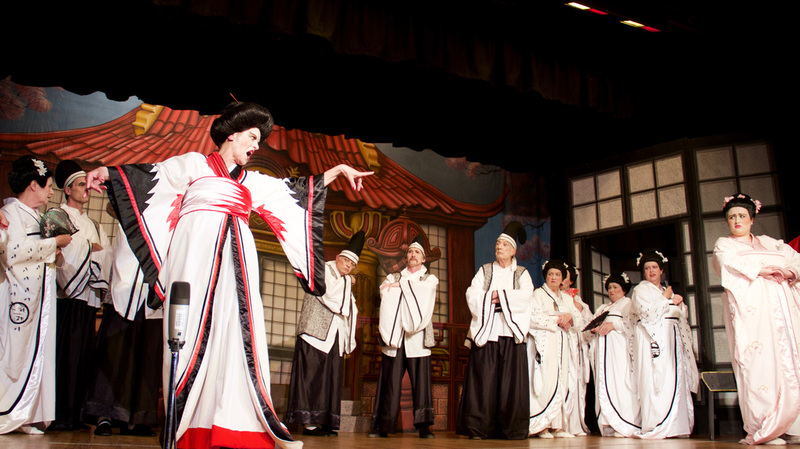 Alongside the amazing talents of Owain as musical director and Meryl as choreographer, we have produced the show you see before you. 19th century; however the observations and reflections fit many modern day situations perfectly. 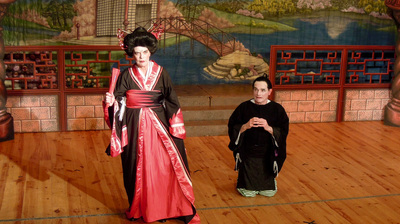 Listen carefully to Ko-ko’s “Little List” of people he could do without and you will see what I mean! 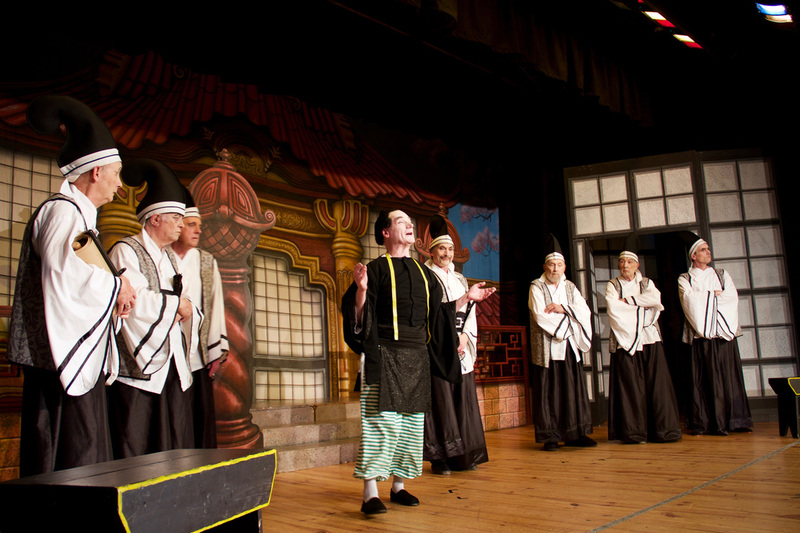 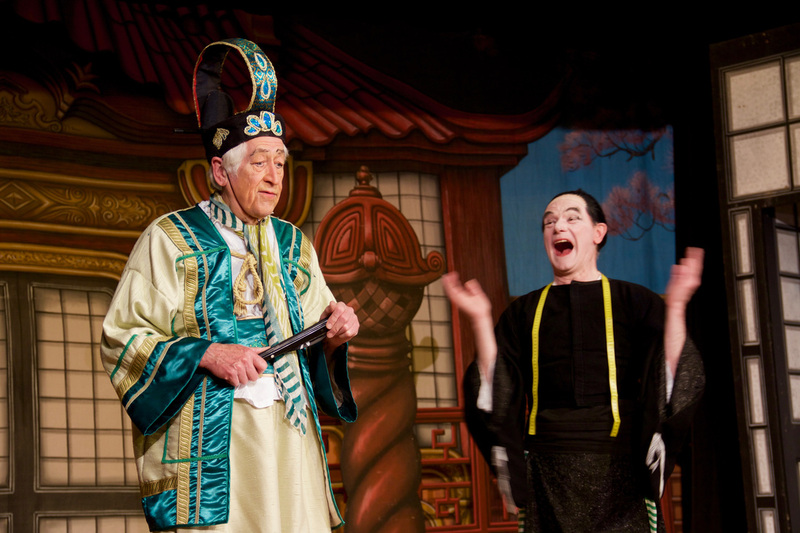 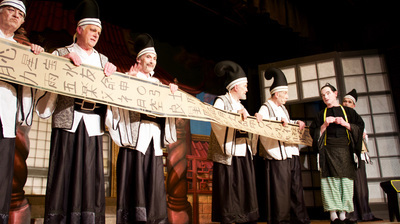 The cast have taken on the fun element of the show which is often, sadly, lost to people who have never seen any Gilbert and Sullivan shows. 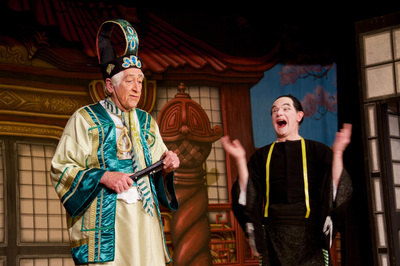 Please feel free to laugh with us as we portray the complexities and difficulties which follow Ko-ko’ unexpected elevation to the post of lord High Executioner (Pooh-Bah has already taken all the other available positions). Sadly, he has never killed anything before, so he pretends to have killed a member of the Titipu town band who, unfortunately is related to the Mikado! 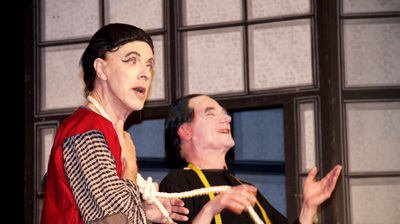 The story follows his attempts to extricate himself from this mess without getting himself killed himself. 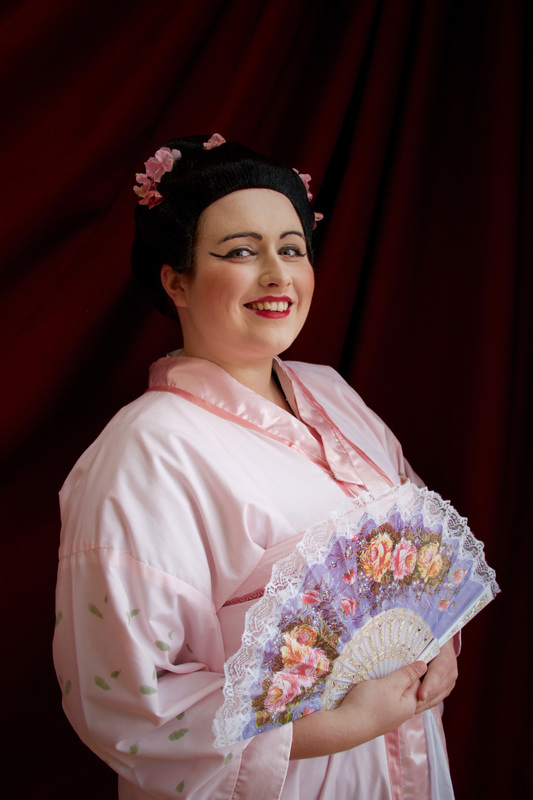 Owain studied singing at the Royal Welsh College of Music and Drama and is a former member of the National Youth Choir of Great Britain and the Welsh National Youth Opera. 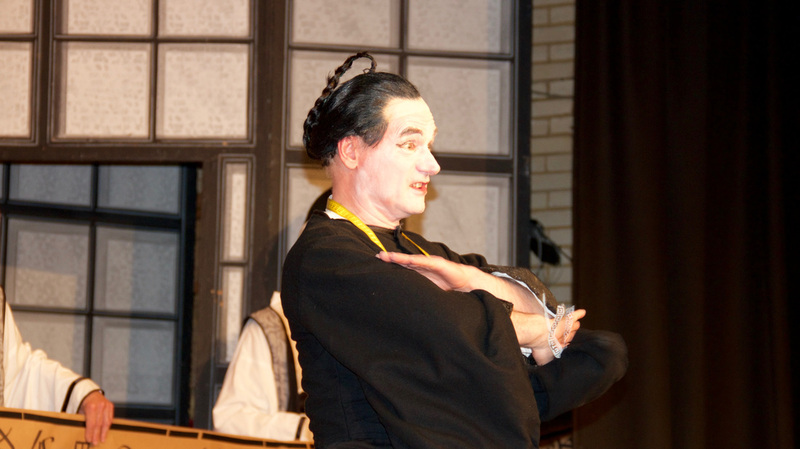 He has been teaching for the last 15 years and has worked with young people aged 3 to 18, many of whom have made their careers as musicians and performers. He is currently Music Lead and a class teacher at a primary school in Hackney. 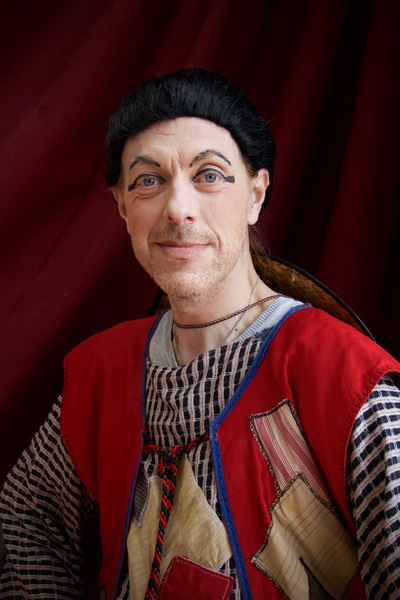 Dedicated to quality music making in the community, Owain is Director of Music at St. Andrews Church in Boreham and is on the committee of the Chelmsford competitive Festival of Music, Speech and Drama. 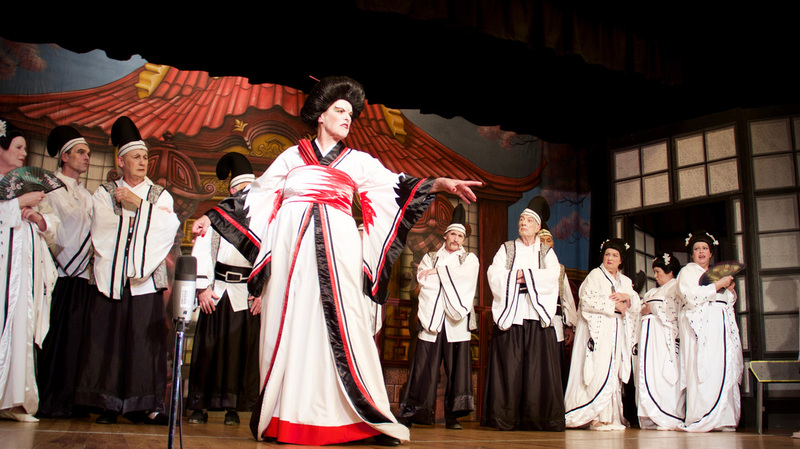 Much in demand a musical director, choral conductor and singing leader, Owain has worked with a range of community music groups including Chelmsford Opera and the Chelmer Young Choral Society. As a composer for the theatre, Owain’s original compositions have been heard in productions for Theatre at Baddow and Breakaway Theatre in Hertfordshire. 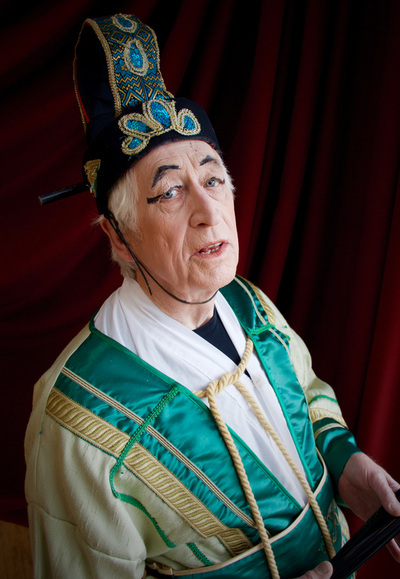 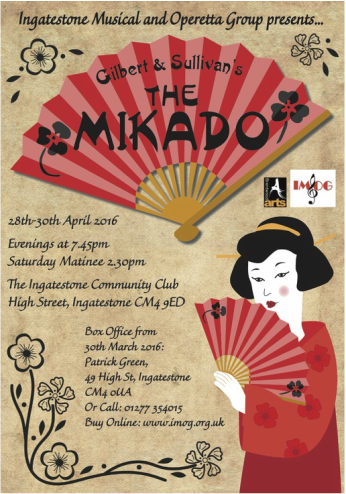 Owain has a lifelong love of Gilbert and Sullivan since seeing an amateur production of the Mikado aged seven and is delighted to be working with IMOG on this show. When societies decide to perform a G & S operetta it is always interesting to see how they interpret the script. Some shows have endless possibilities for changing the time and style of the show. 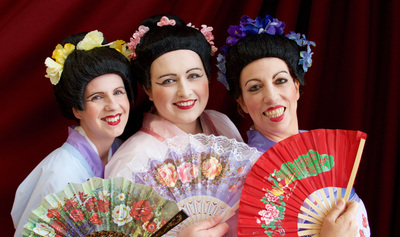 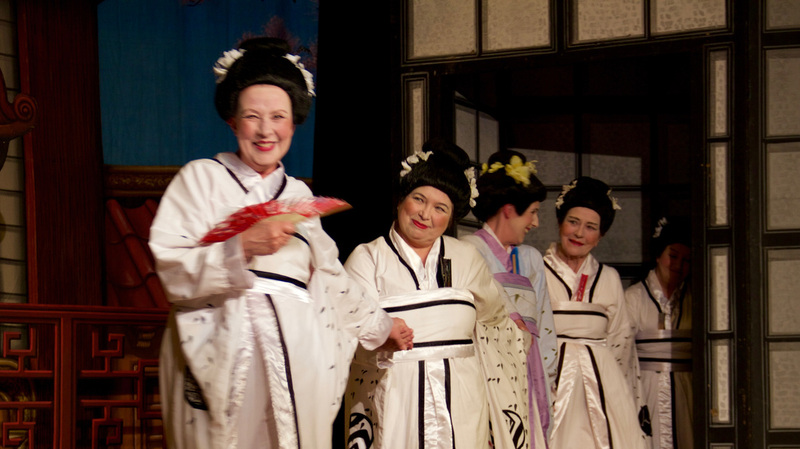 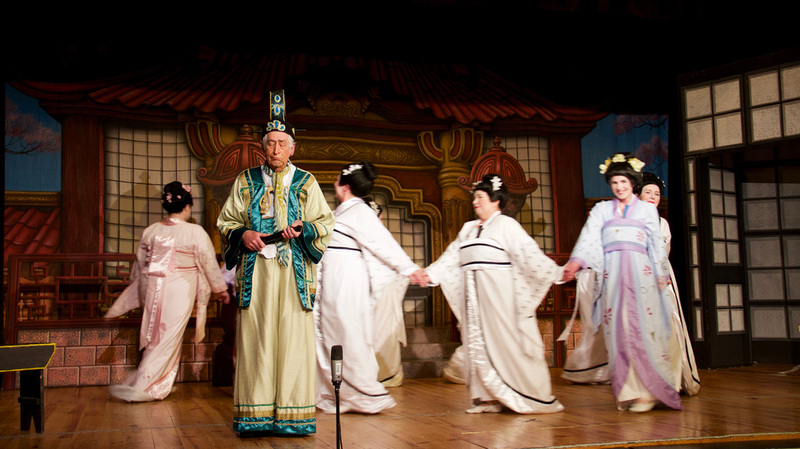 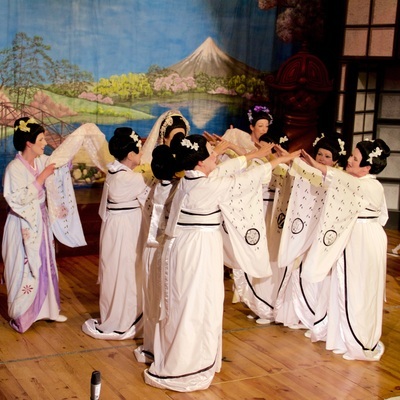 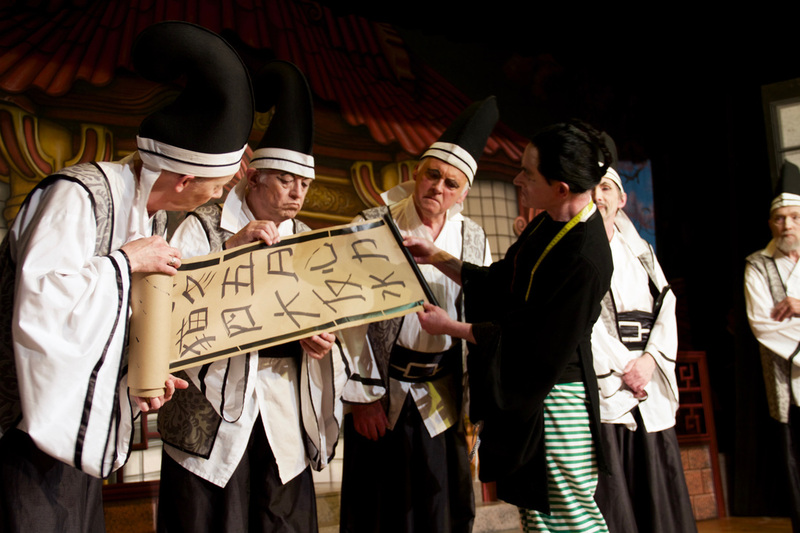 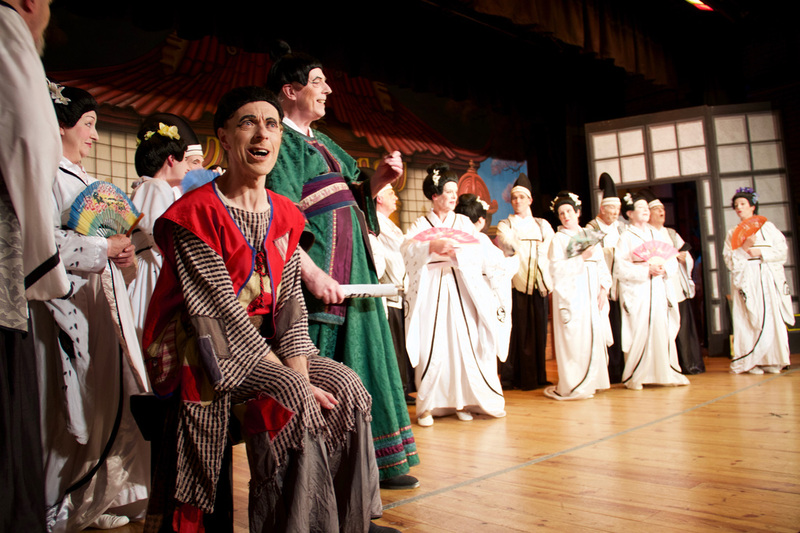 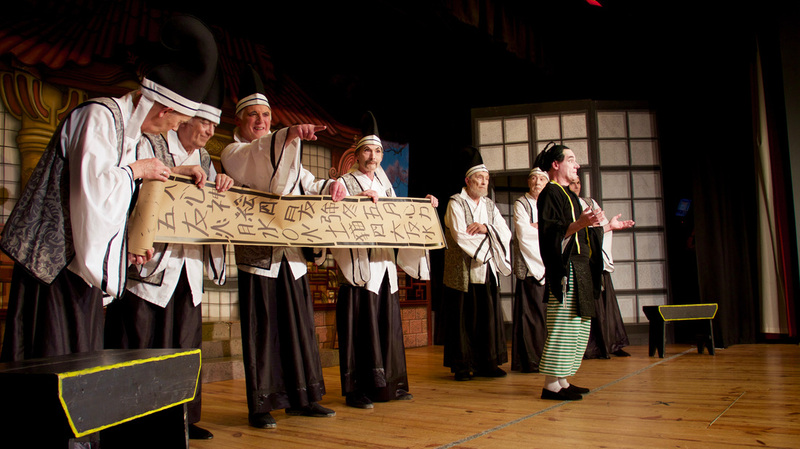 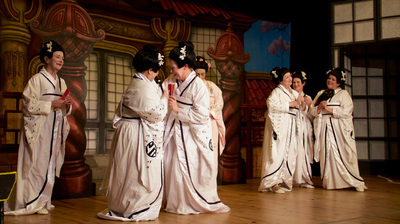 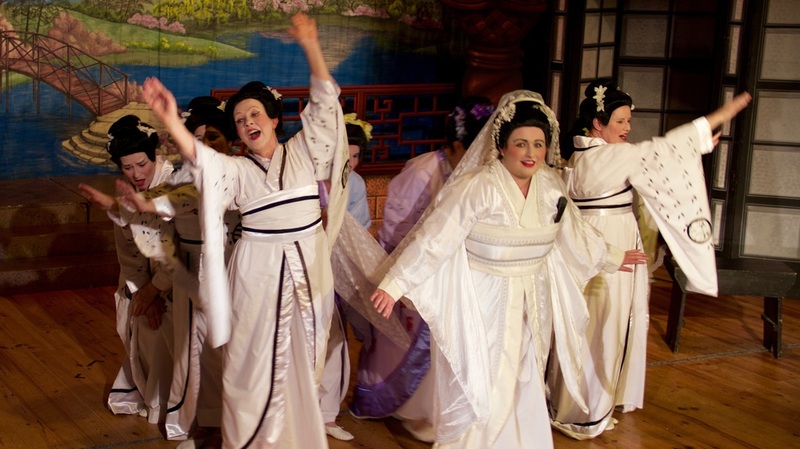 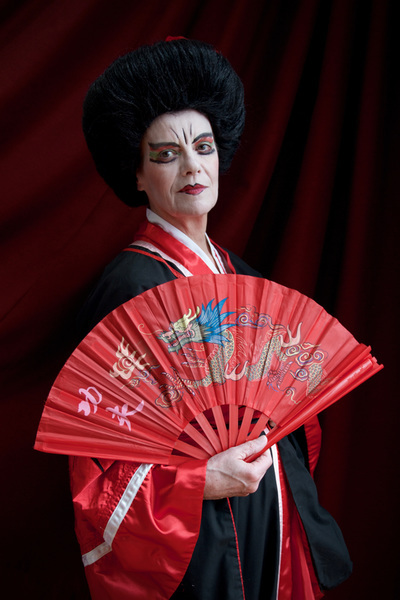 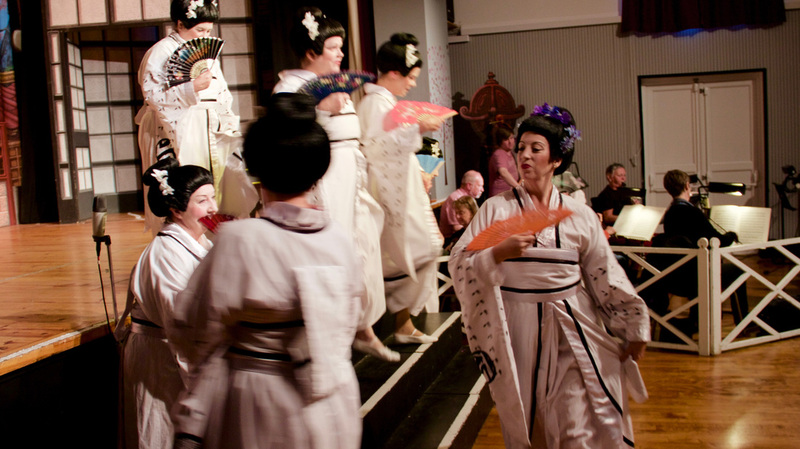 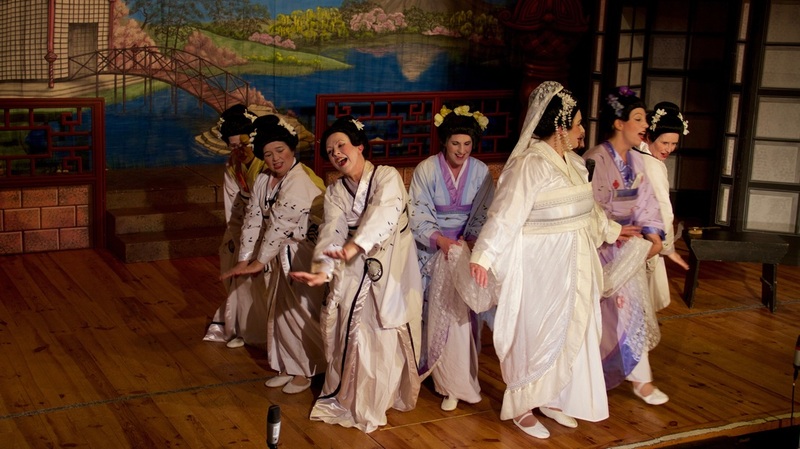 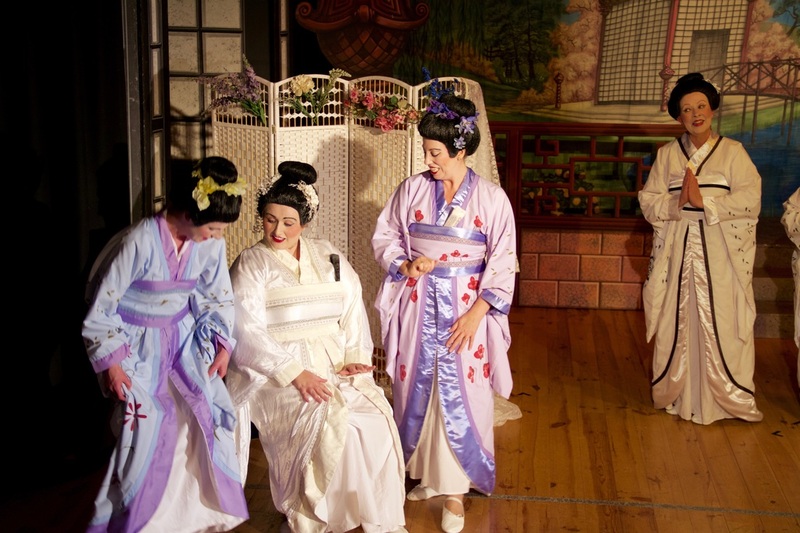 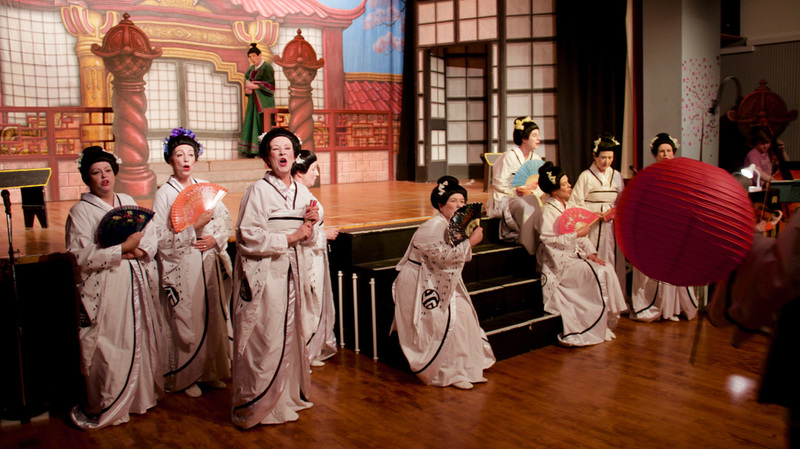 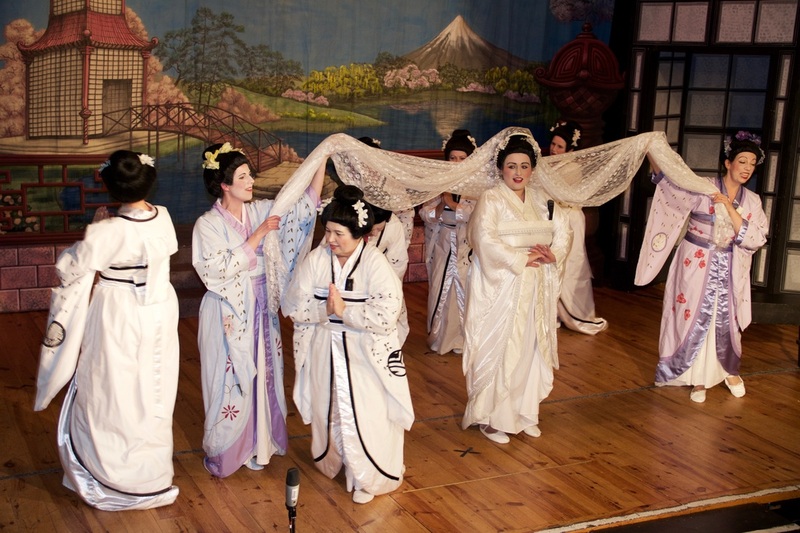 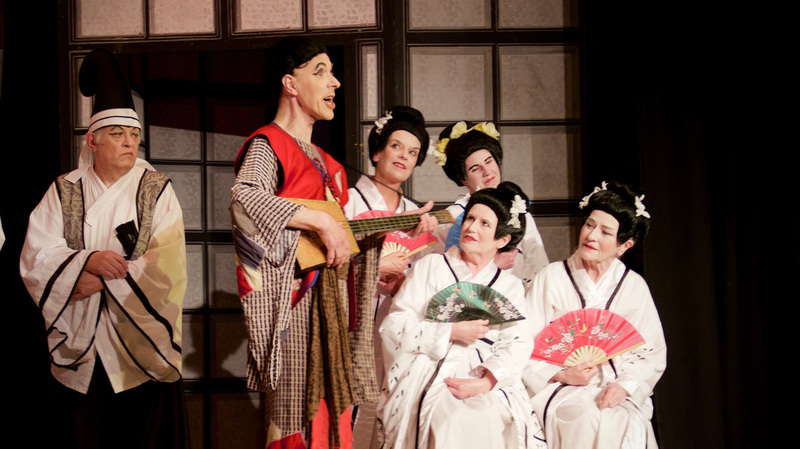 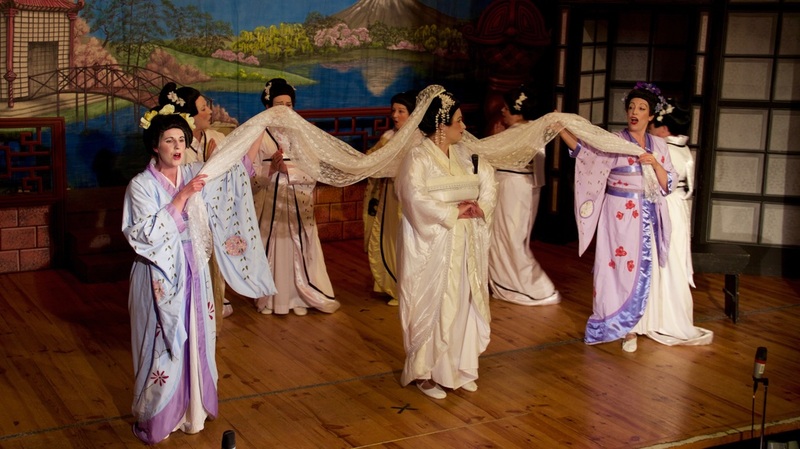 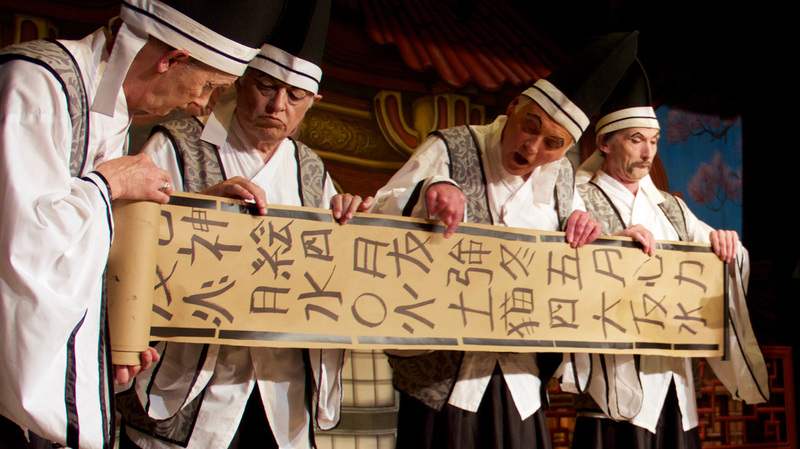 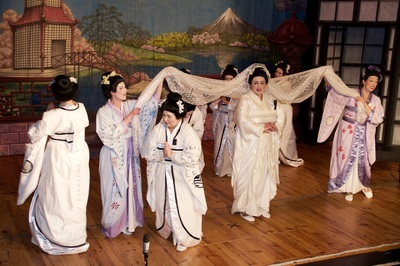 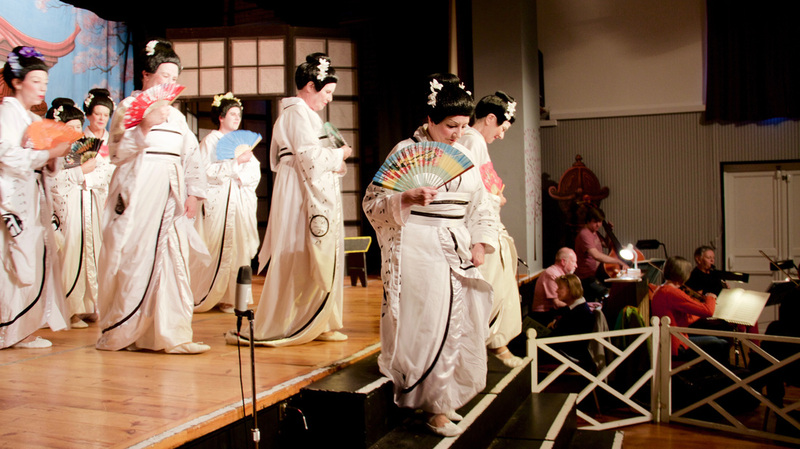 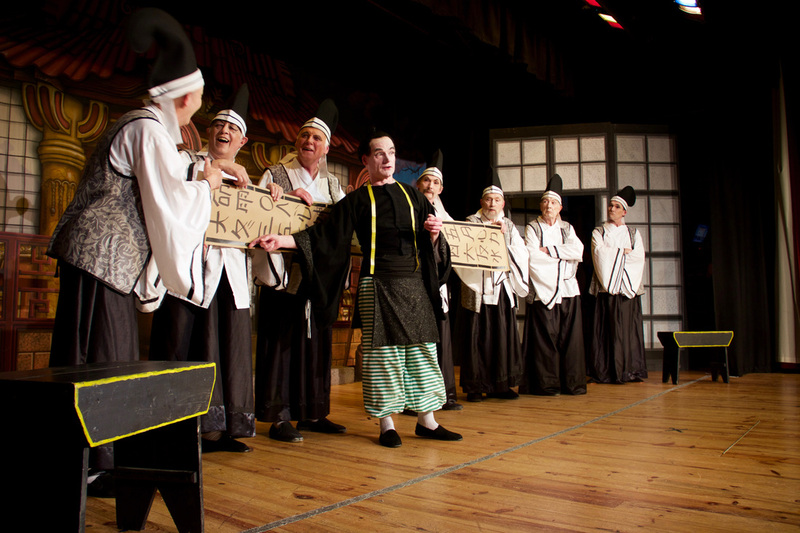 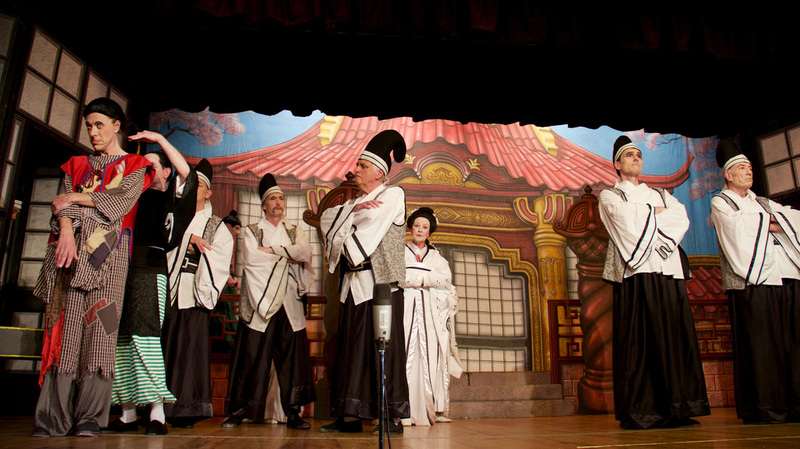 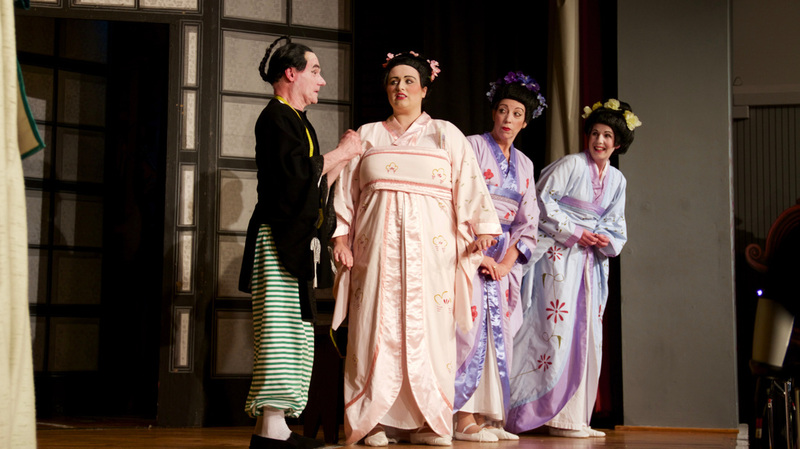 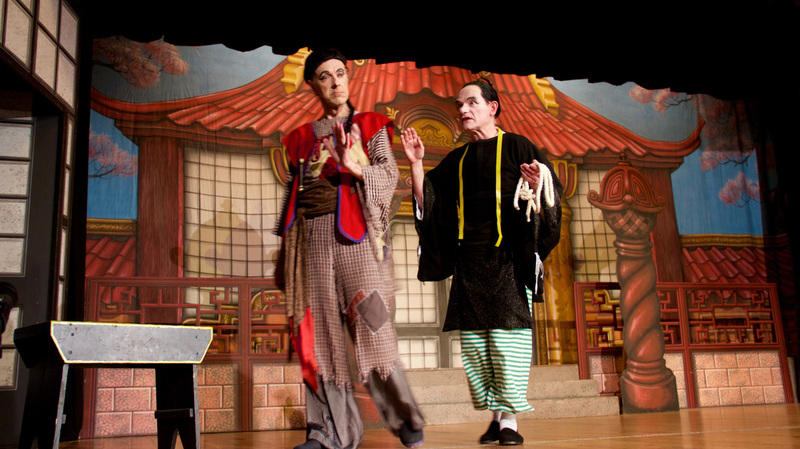 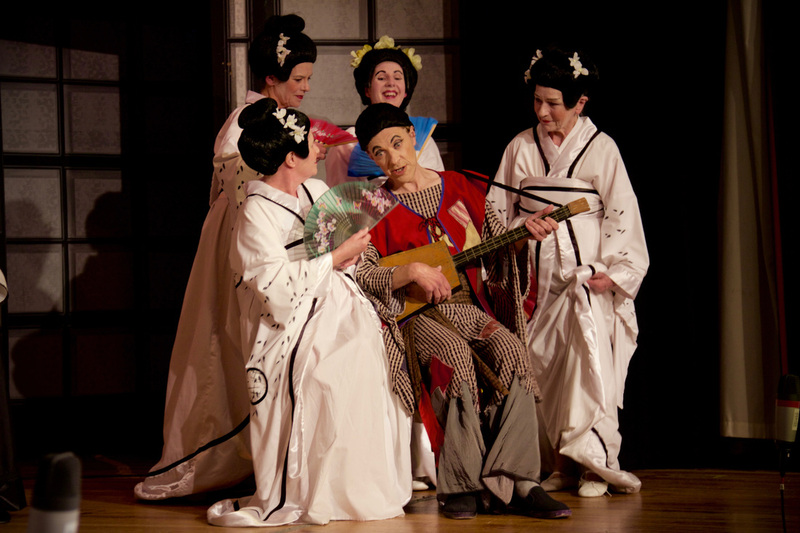 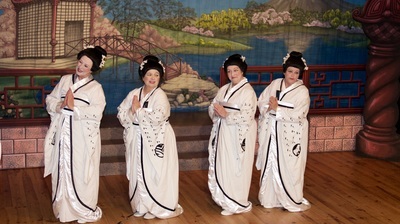 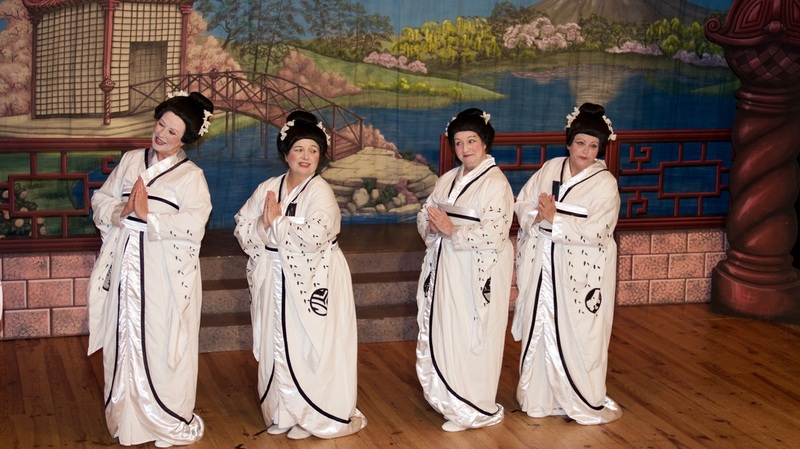 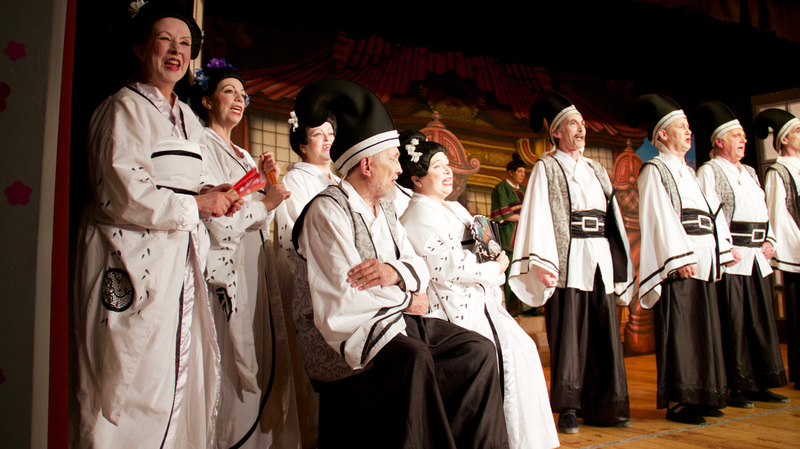 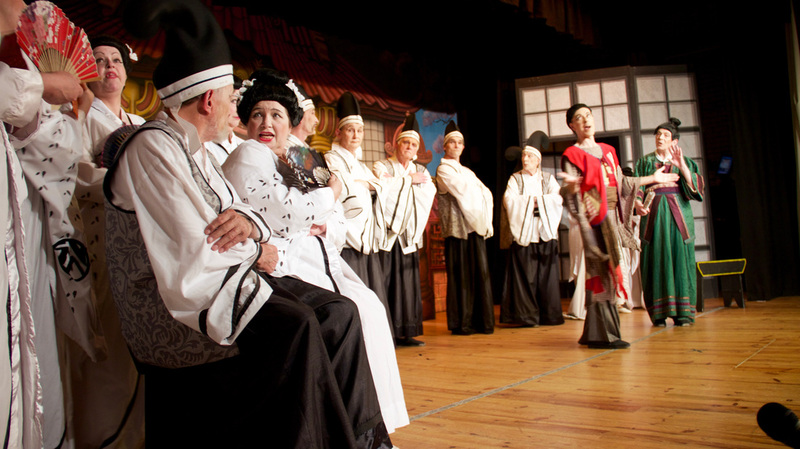 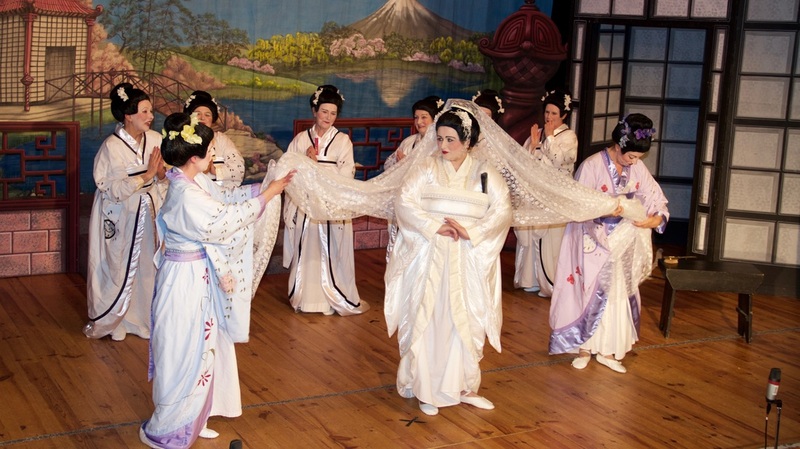 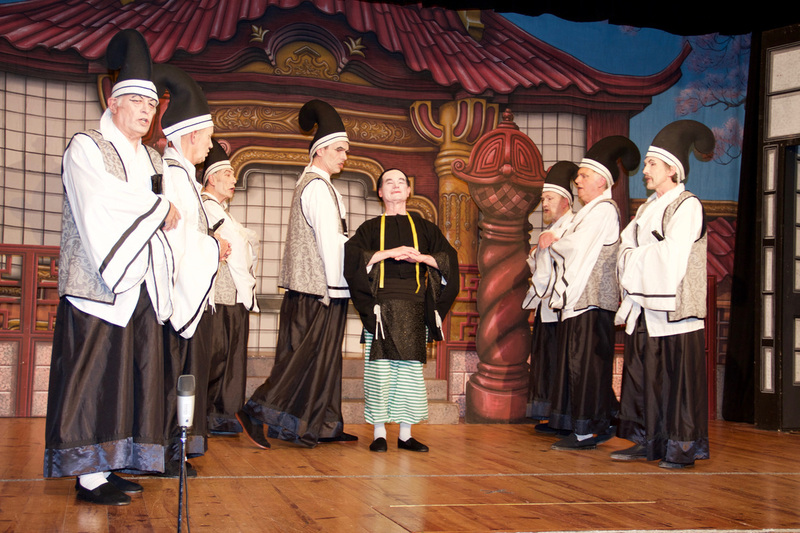 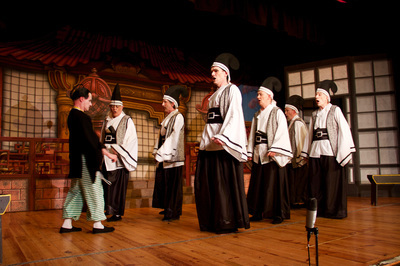 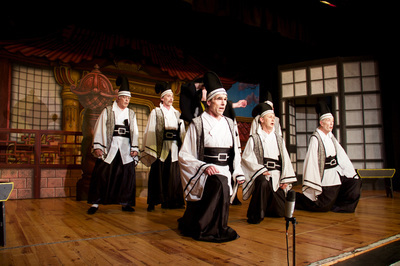 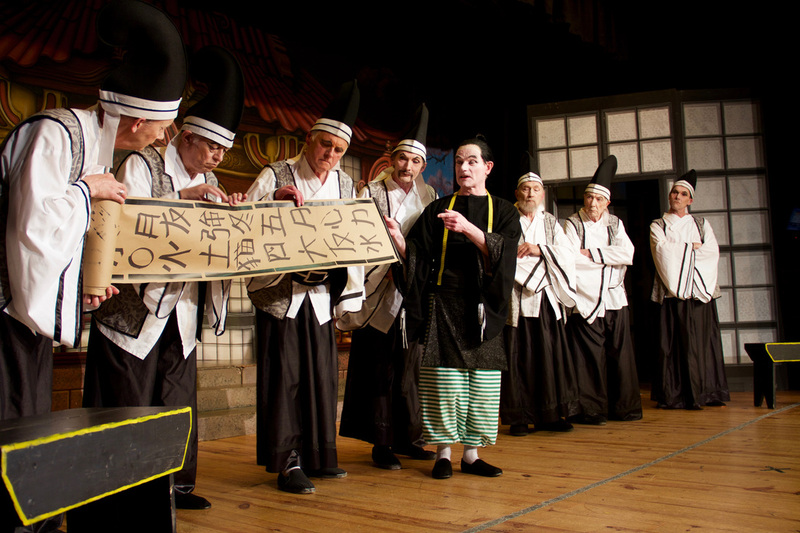 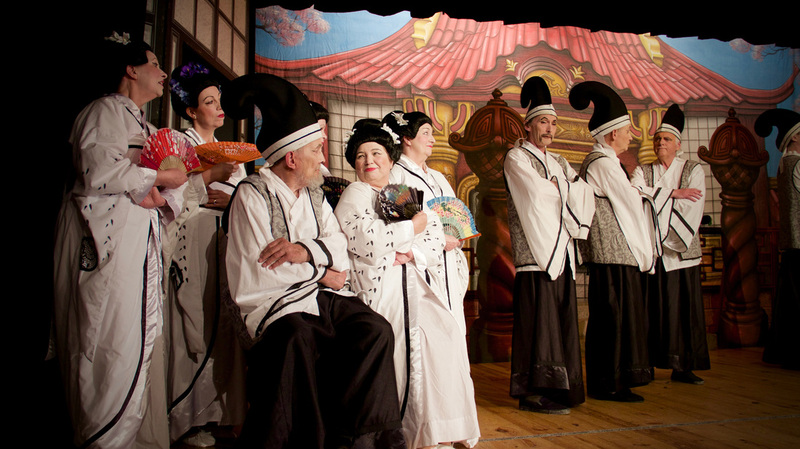 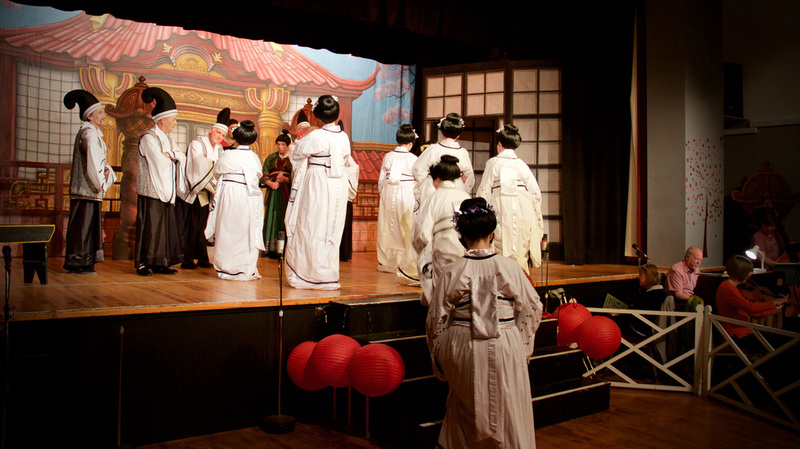 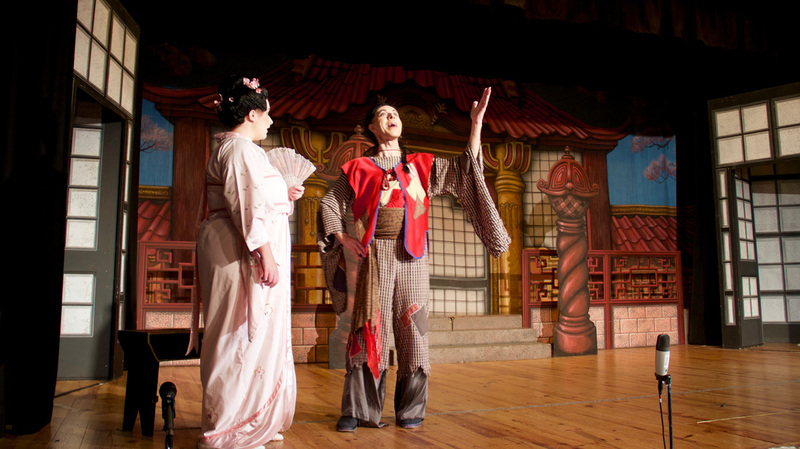 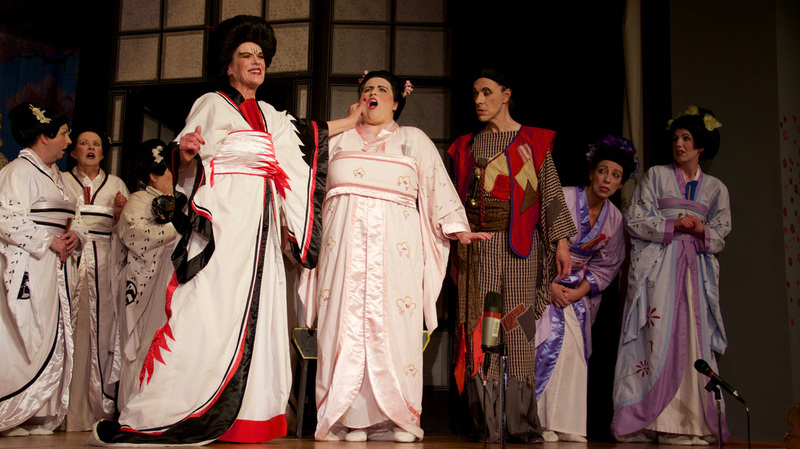 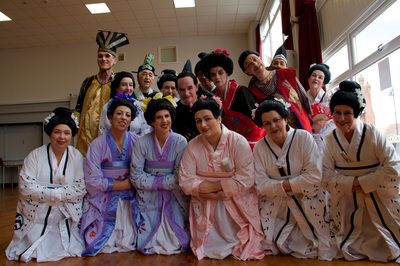 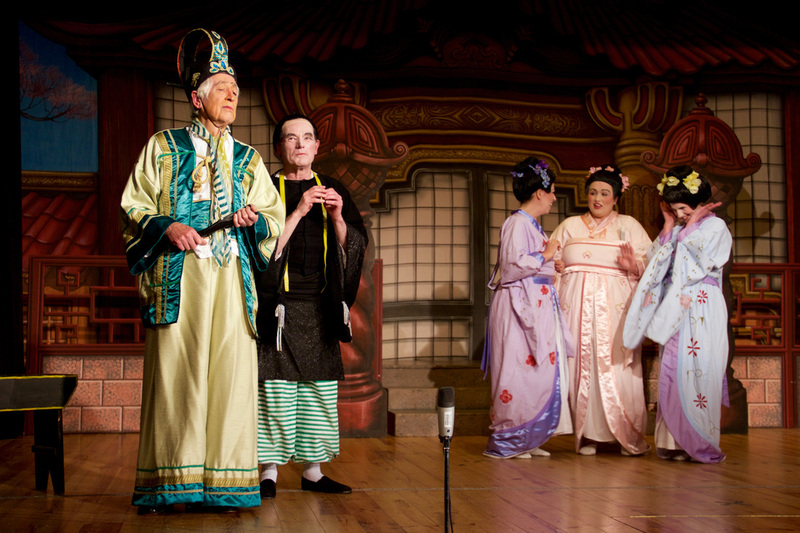 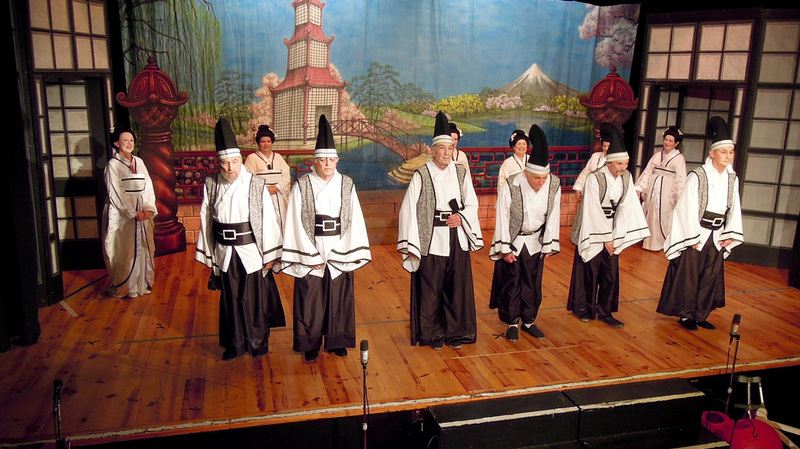 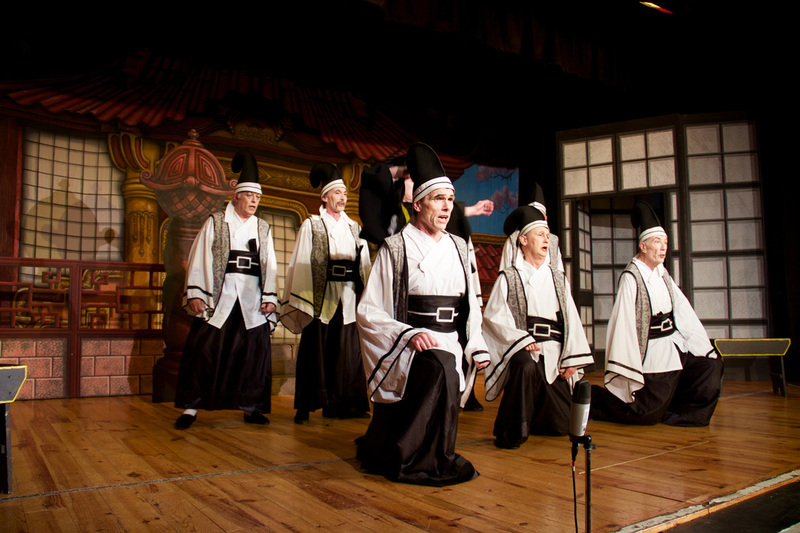 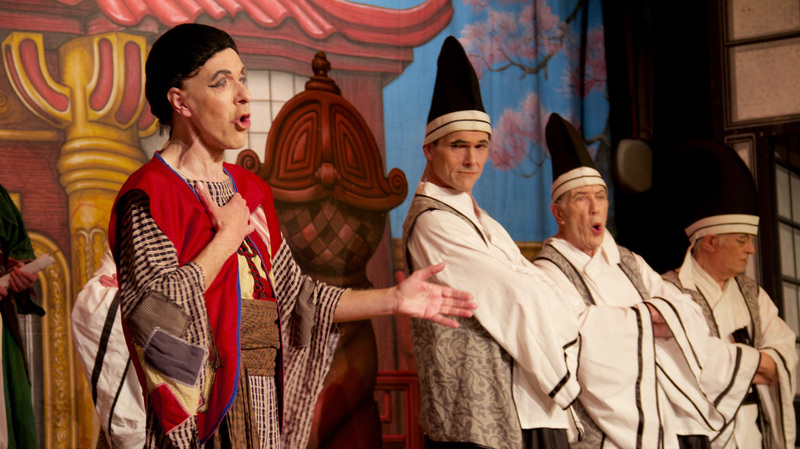 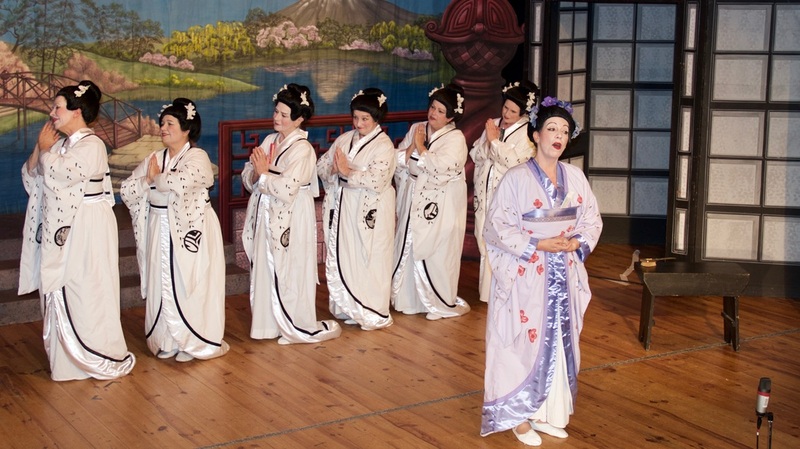 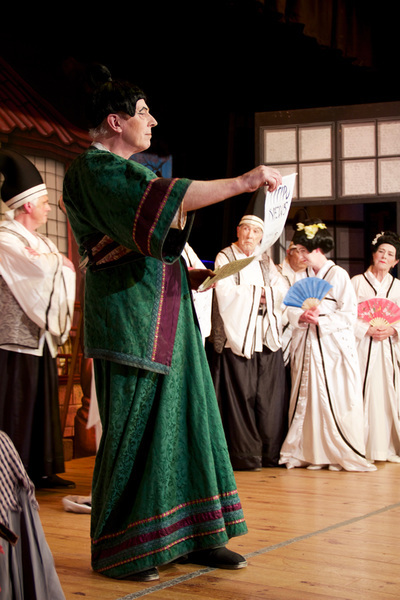 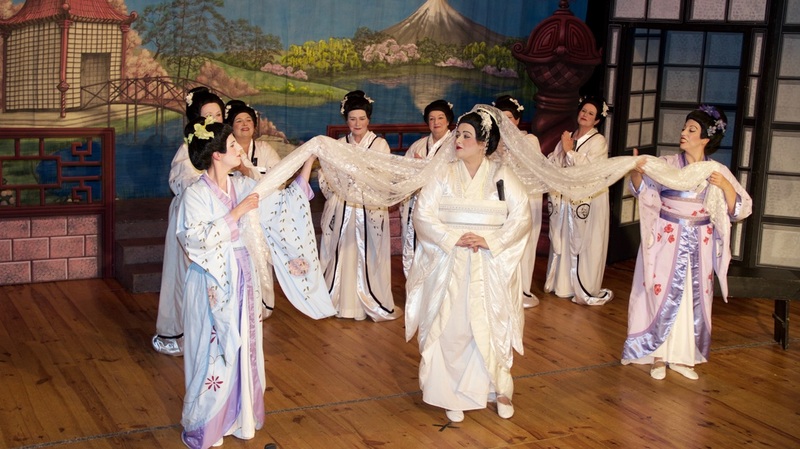 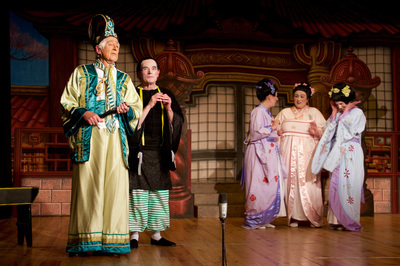 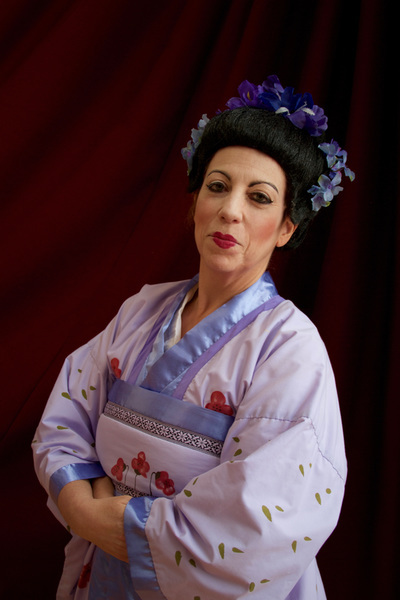 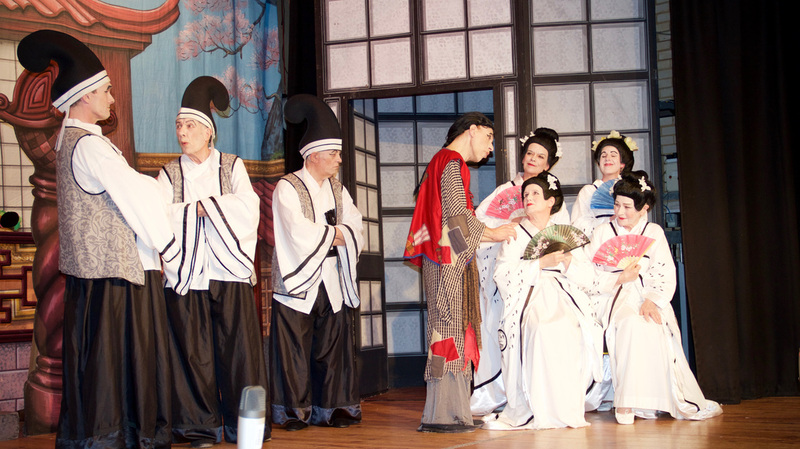 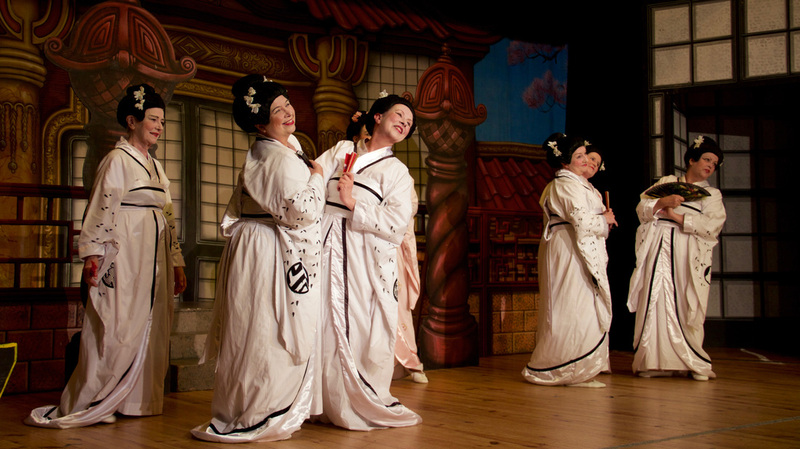 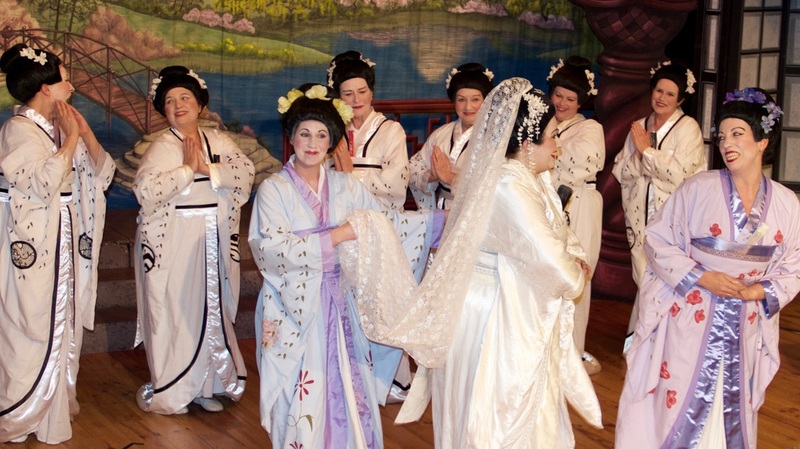 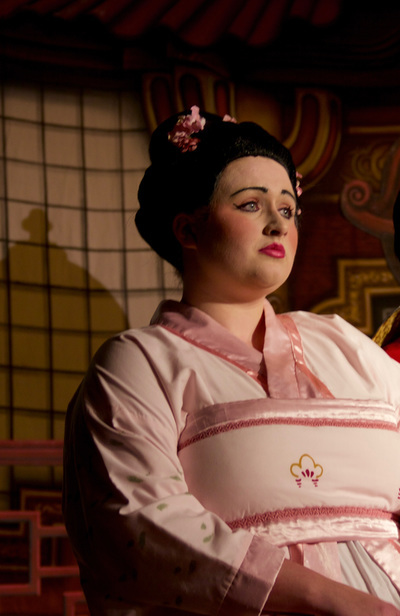 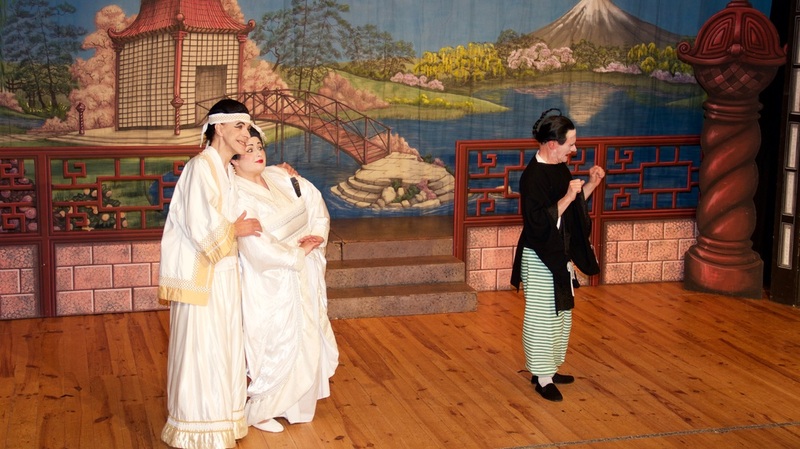 However, The Mikado needs to be done in authentic Japanese style and director, Angie McGlashon, has succeeded in doing just that. 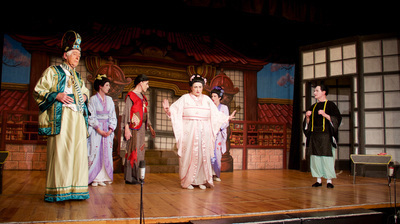 Firstly, I must compliment the entire ensemble on some excellent singing, lovely harmonies and great characterisations on stage. 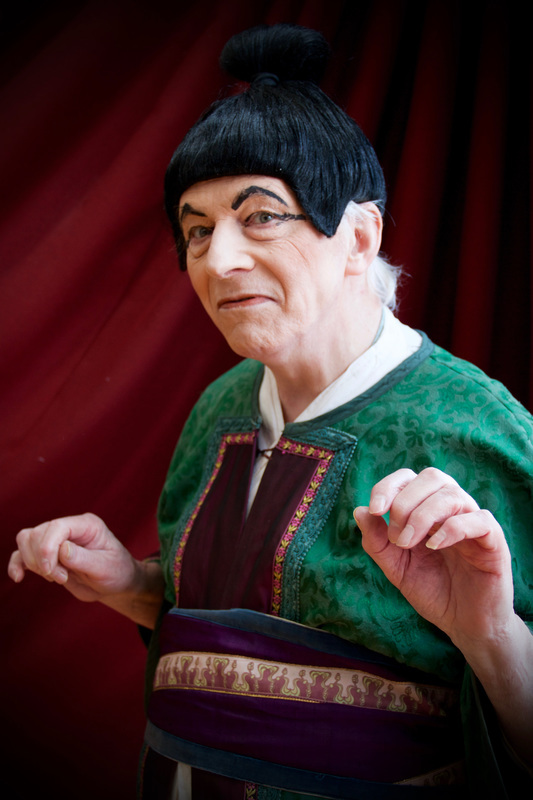 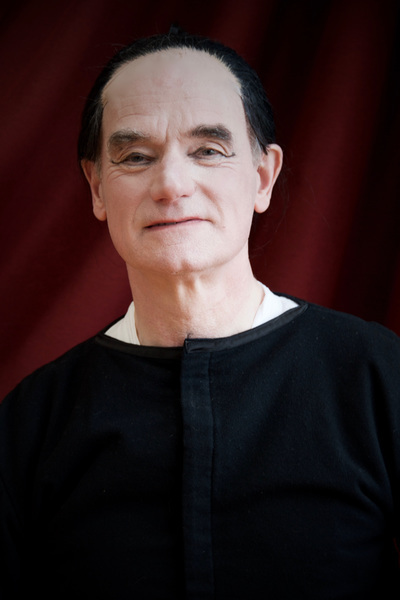 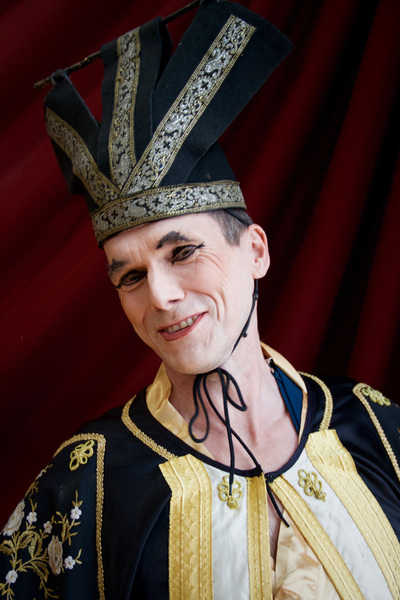 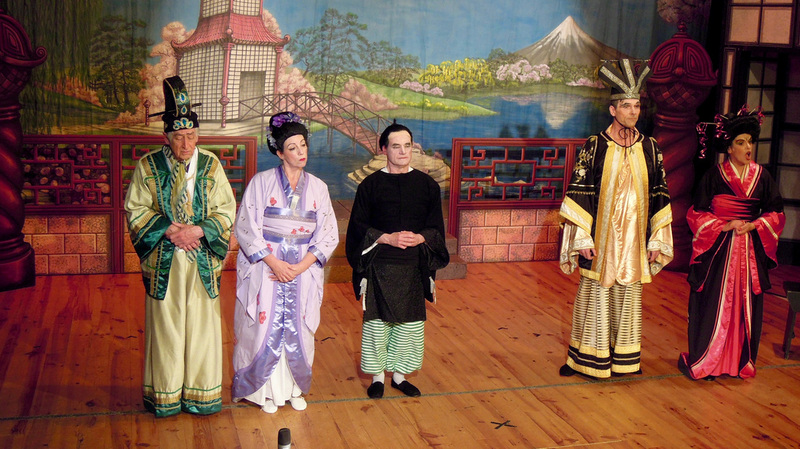 On then to the Principals, Nik Graham (Nanki Poo) gave an accomplished performance, he seemed a little tentative at first (as did some of the other Principals) but it was the first night so this can be forgiven. 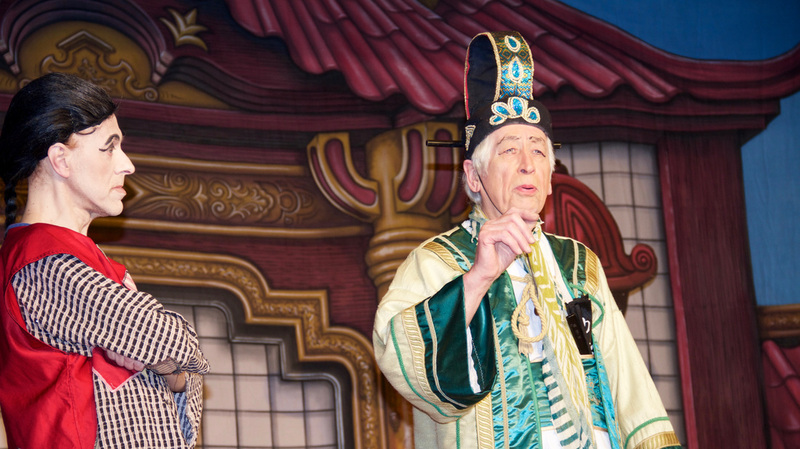 Ken Cooper was terrific as Pooh Bar, this is a lovely part for an experienced actor and Ken made the very best of every line of dialogue. 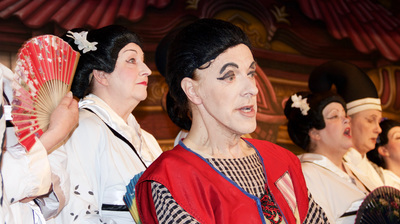 John Lambert gave a very creditable performance as Pish Tush and Richard Pennicard was good as Koko. 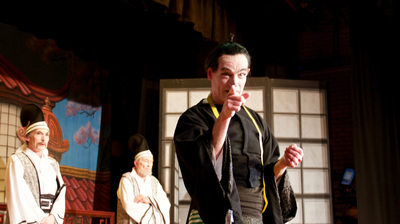 His ‘Little list’ was excellent and clearly touched the audience with its local references. 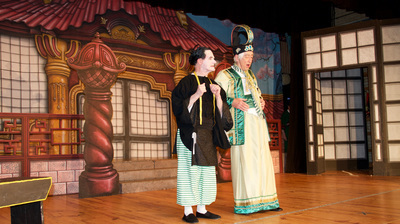 I noted that the mayor was particularly impressed with being included! The ‘Three Little Maids’ were terrific, particularly Amy Welton as Yum Yum, such a beautiful voice. 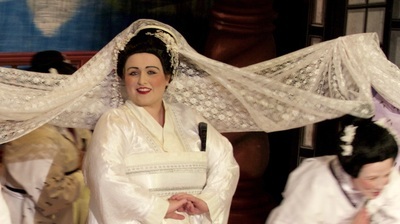 She was very ably supported by Anne Horemans as Pitti Sing (great attitude!) 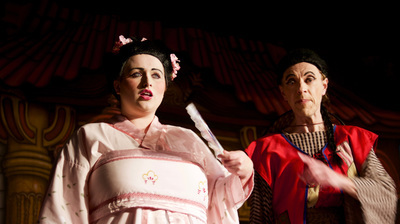 and Deborah Fisher as Peep Bo. 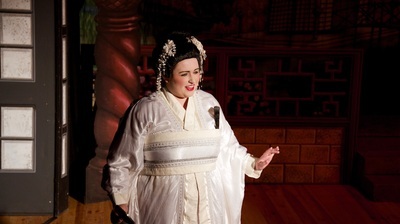 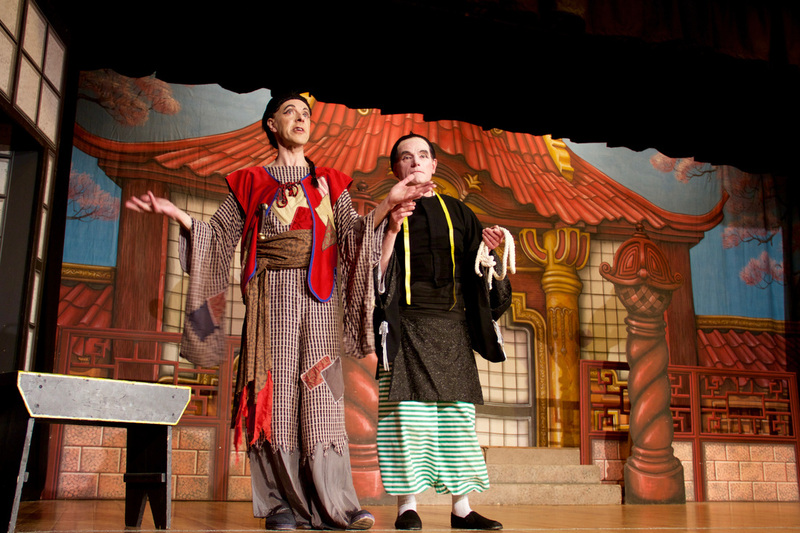 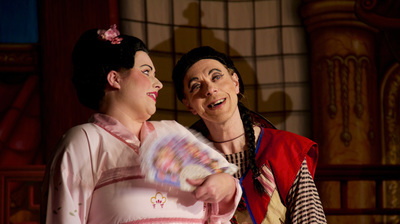 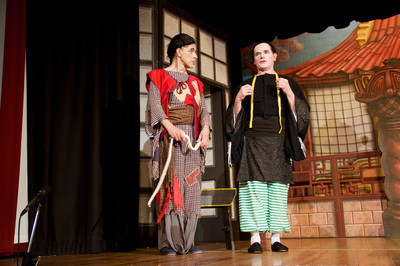 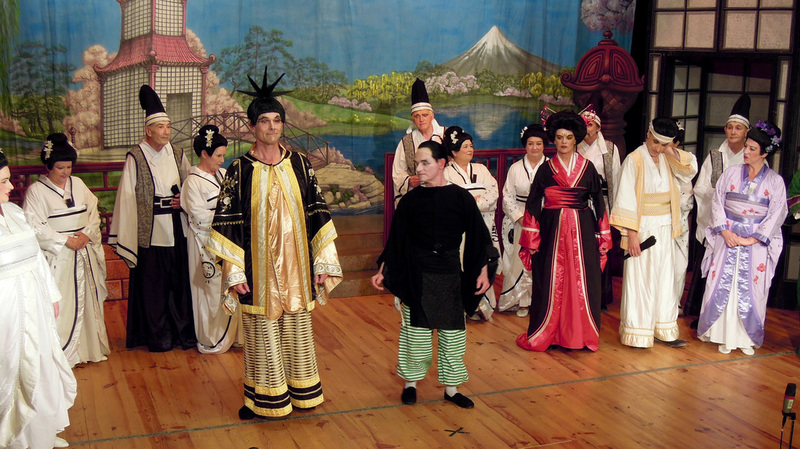 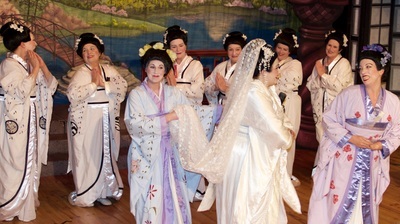 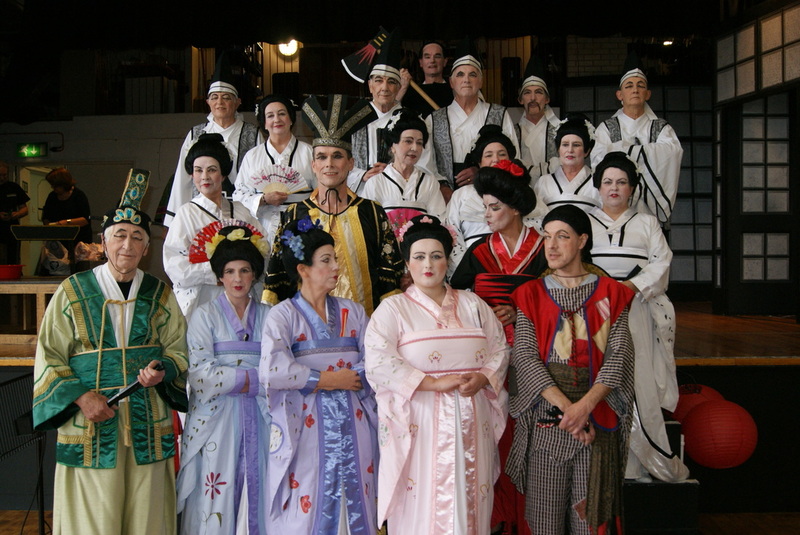 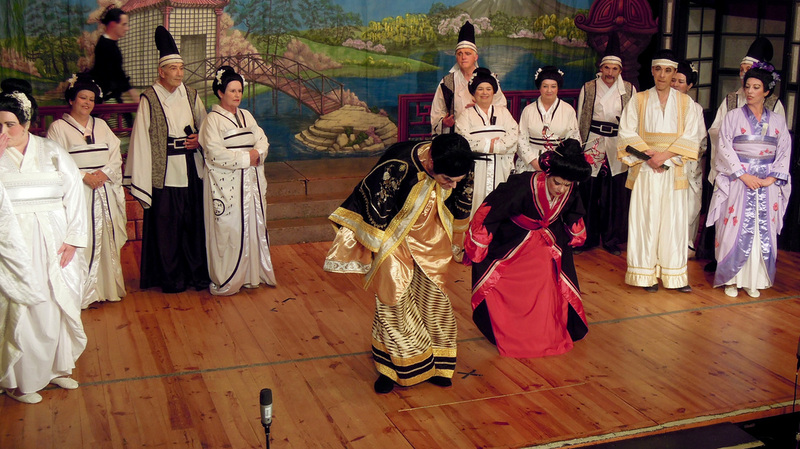 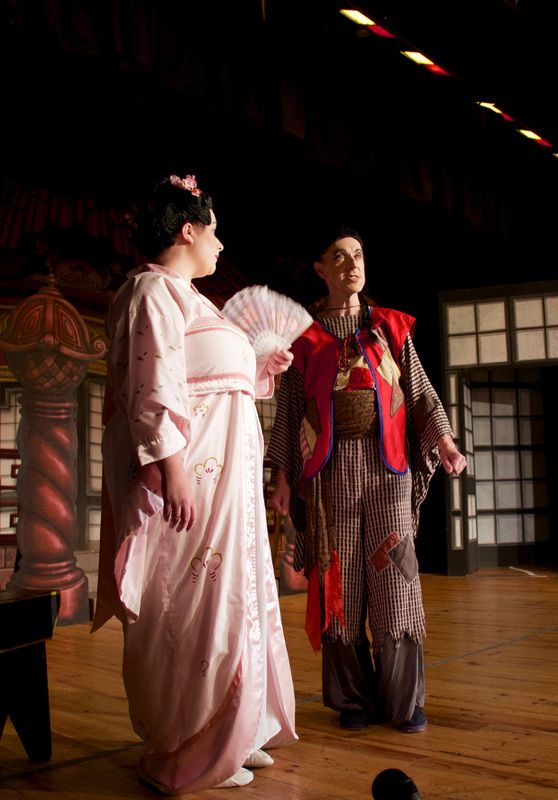 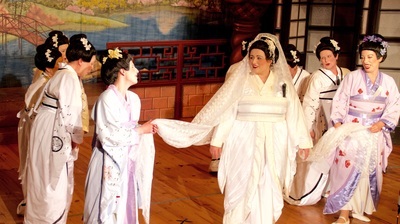 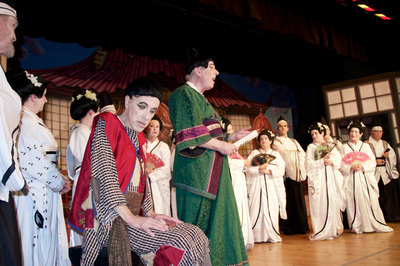 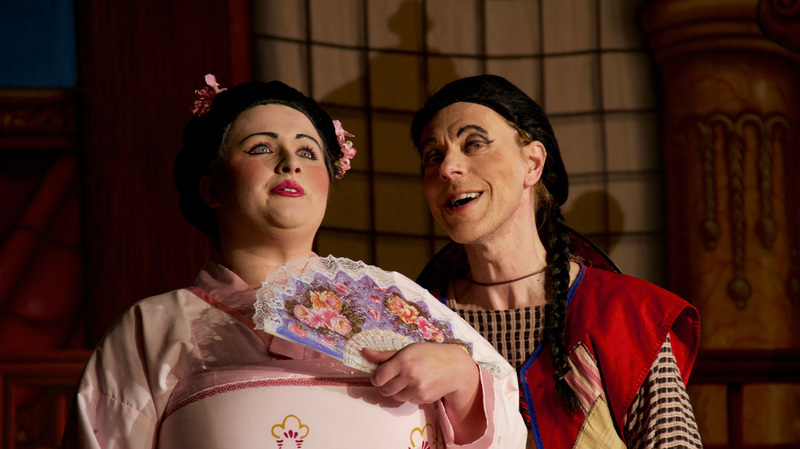 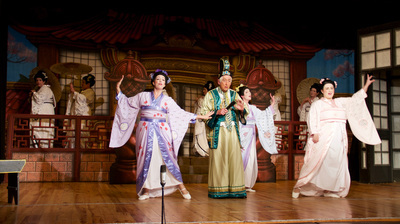 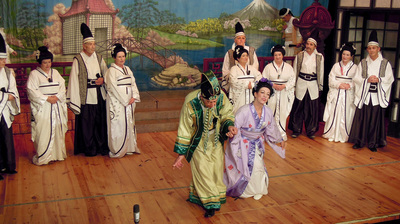 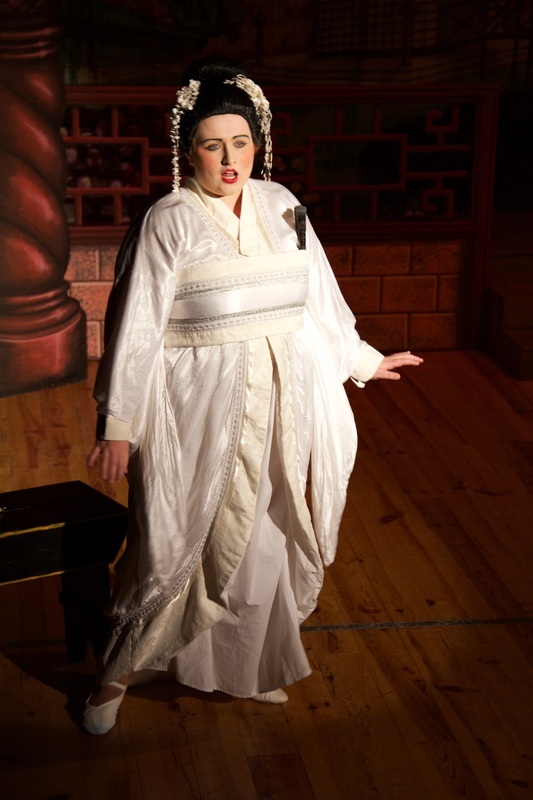 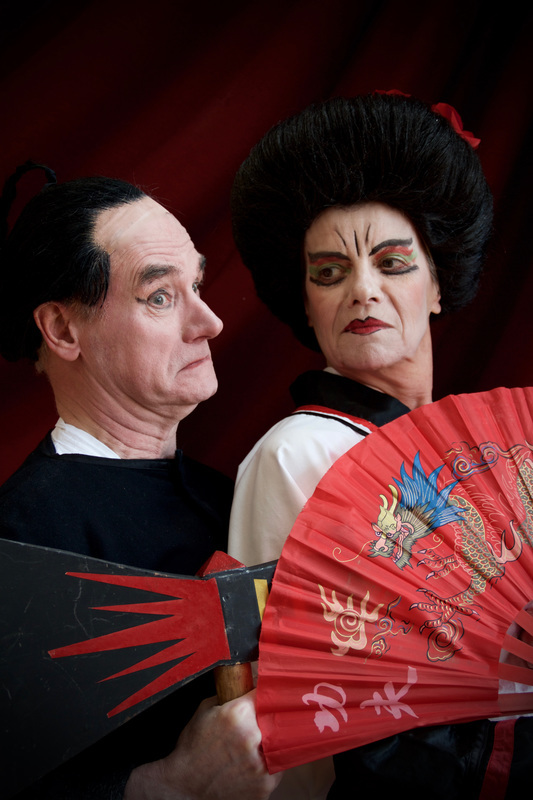 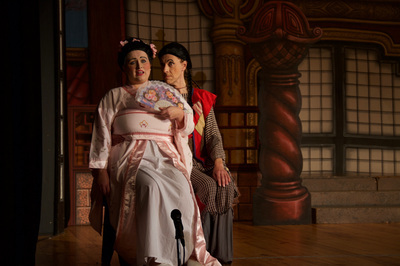 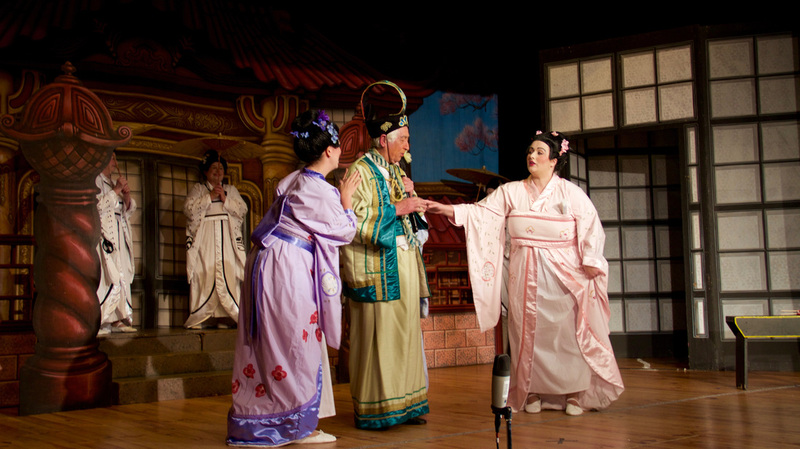 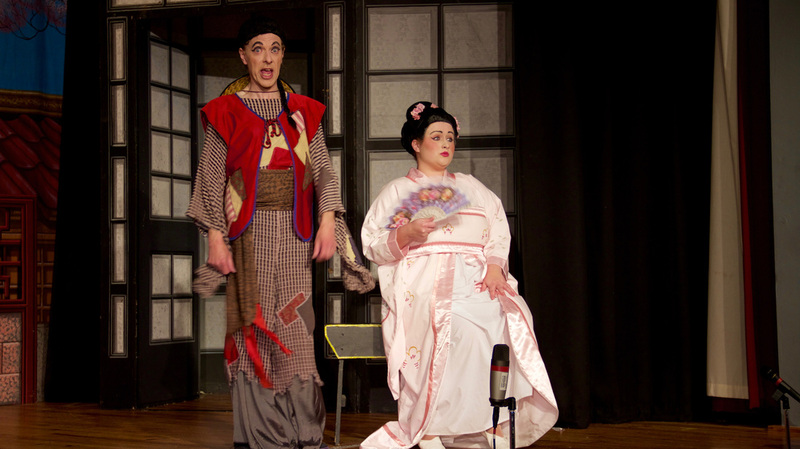 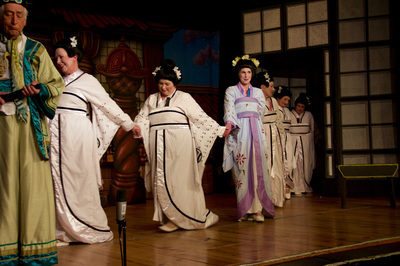 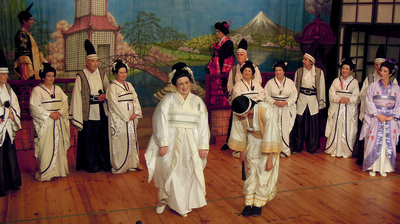 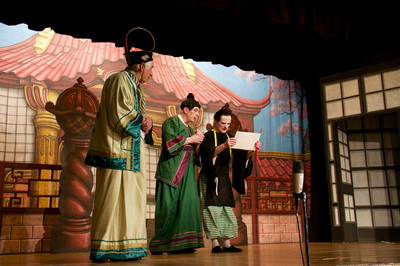 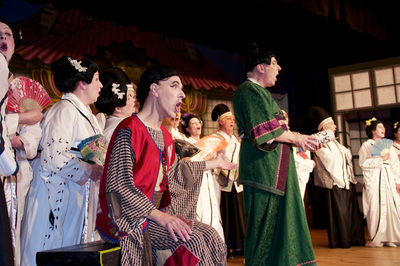 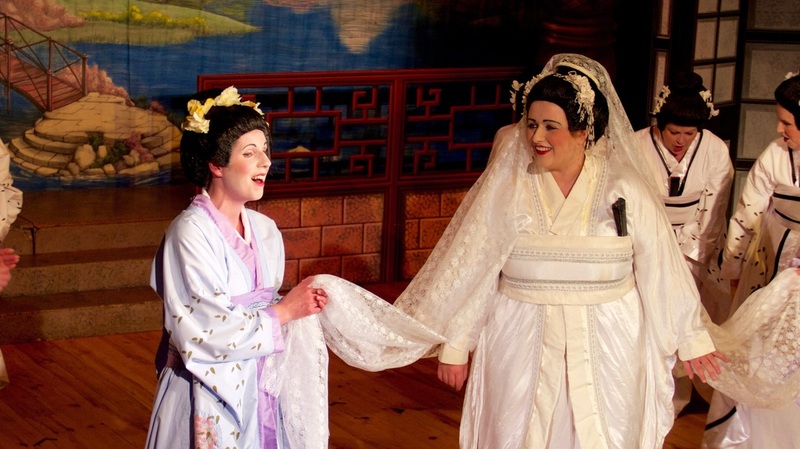 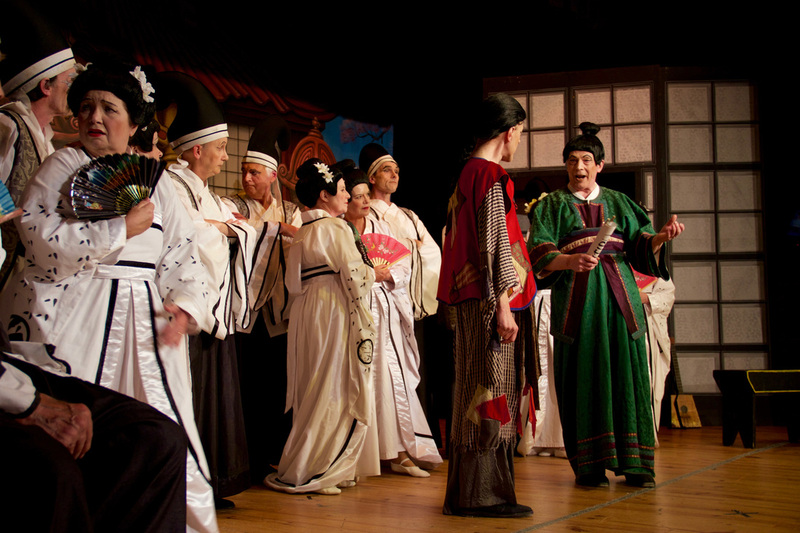 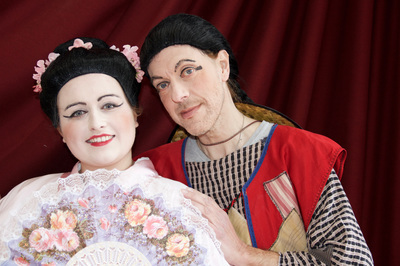 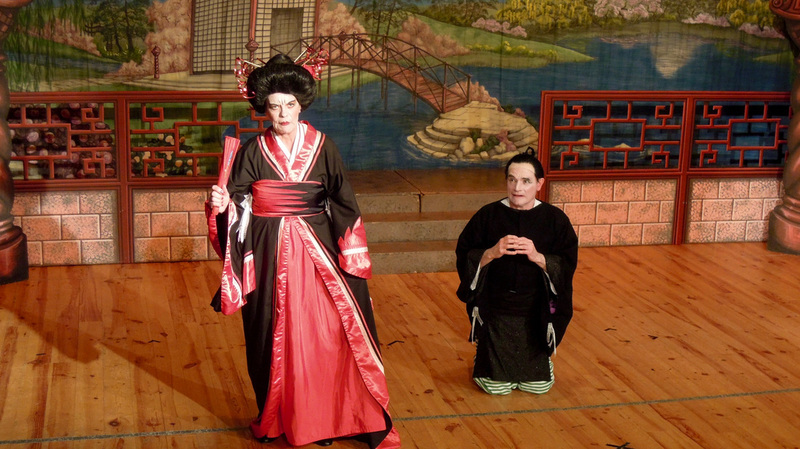 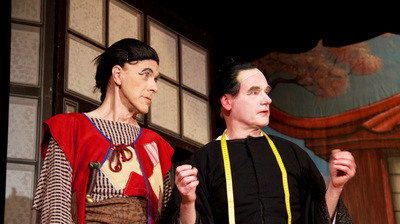 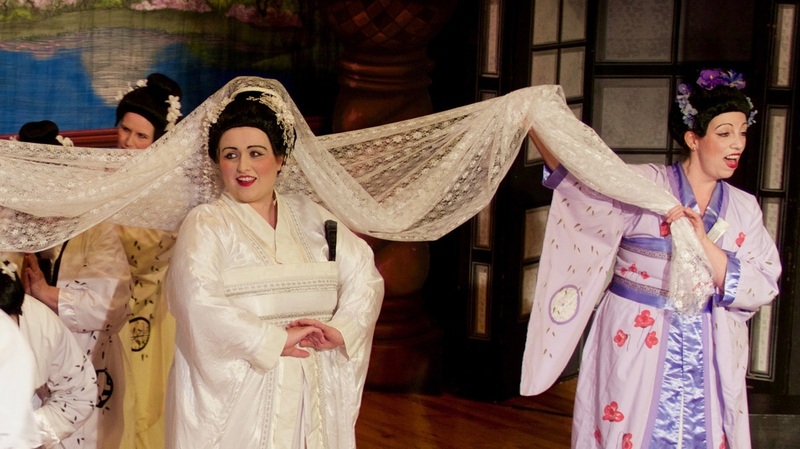 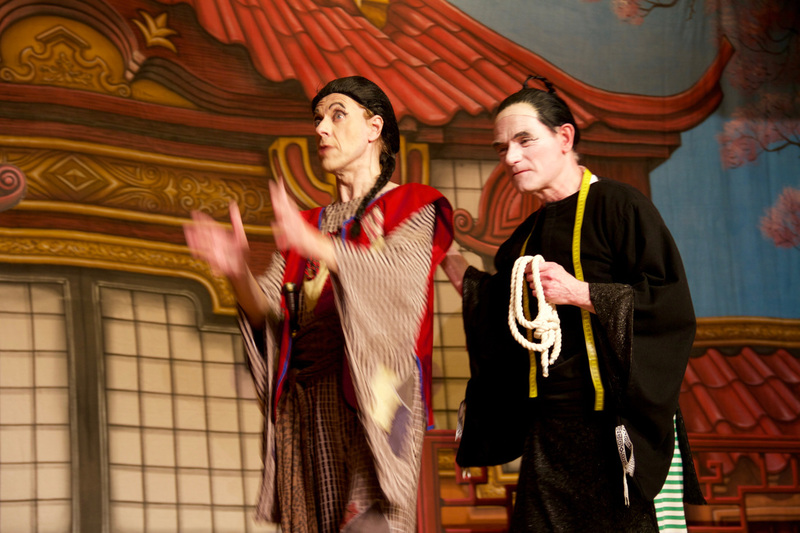 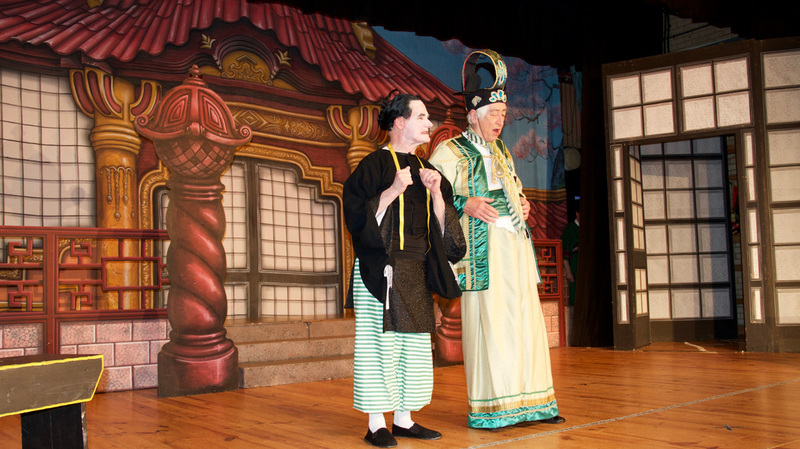 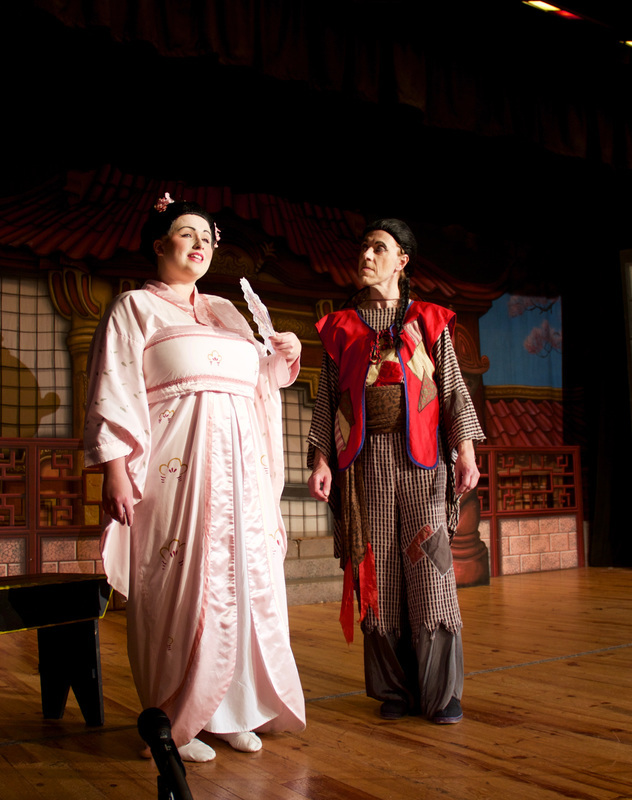 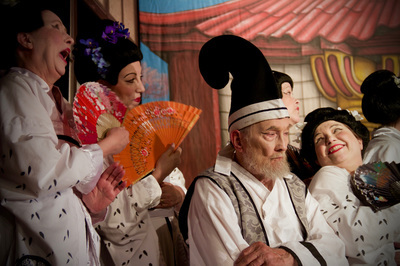 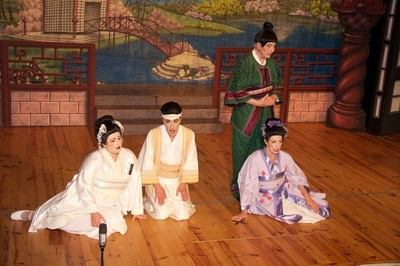 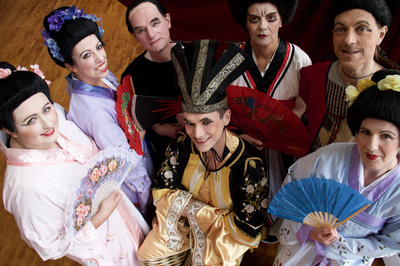 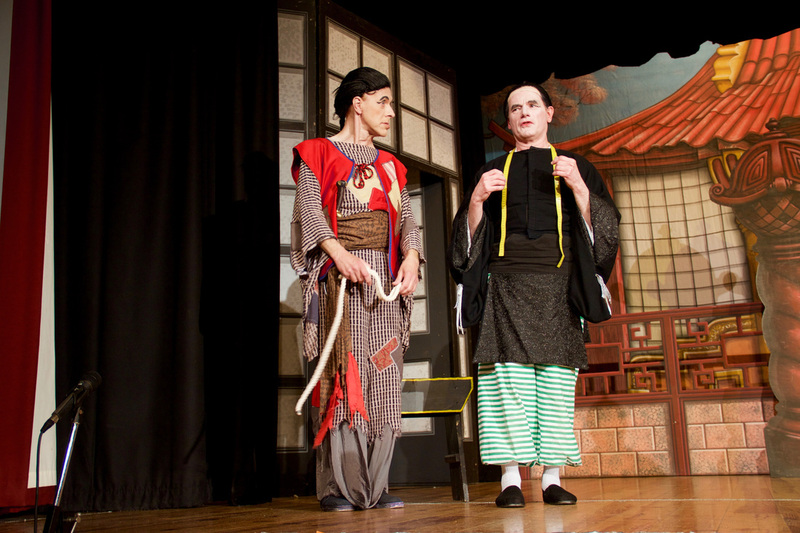 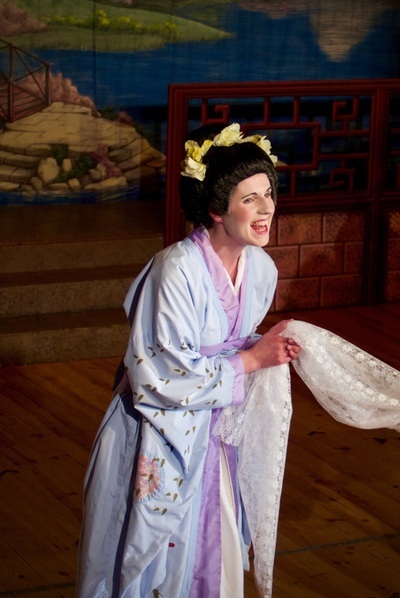 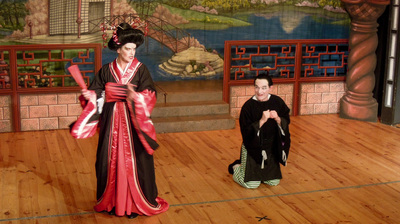 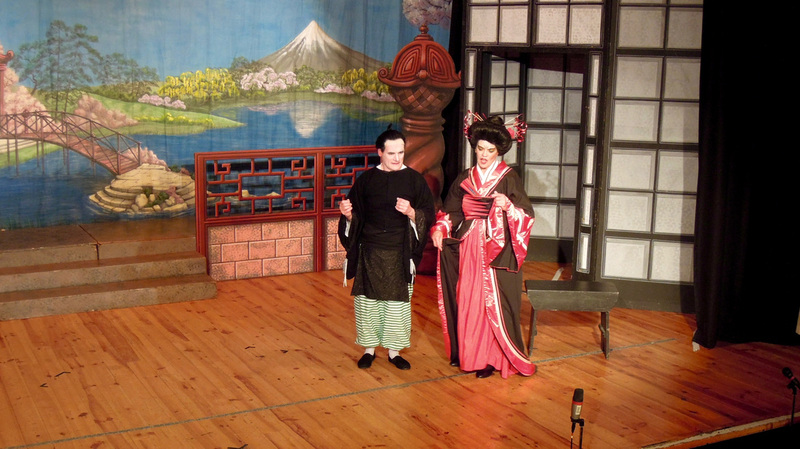 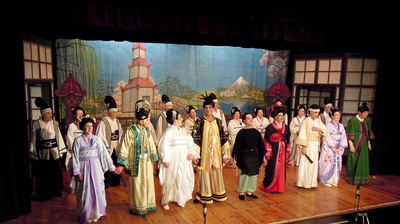 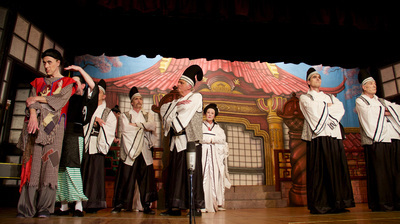 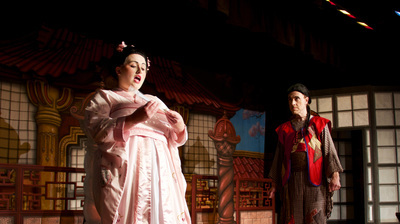 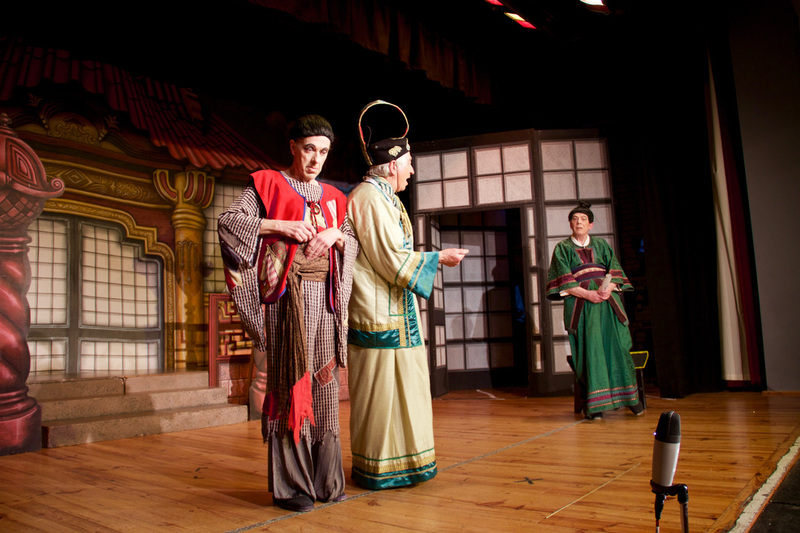 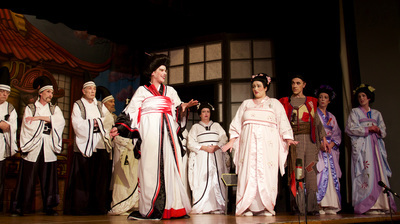 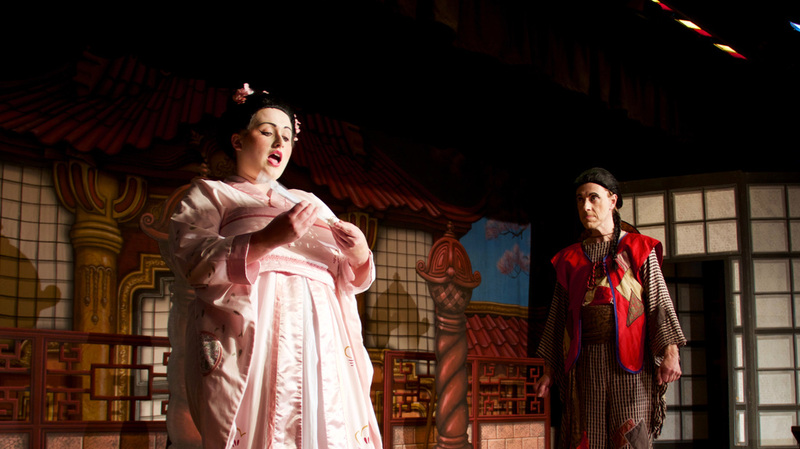 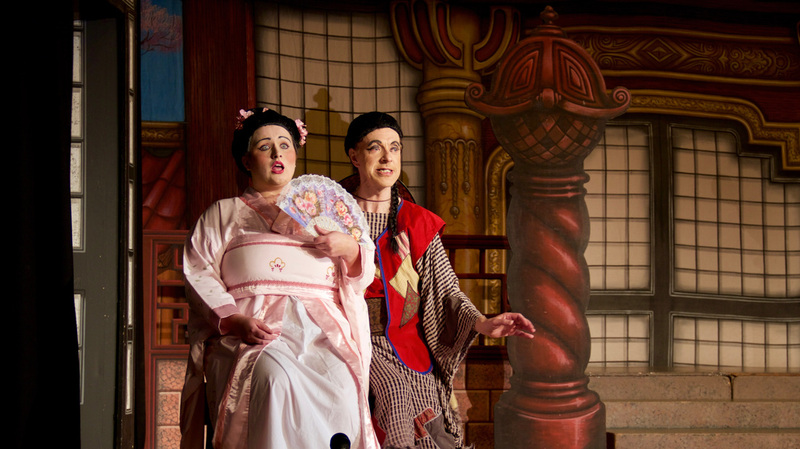 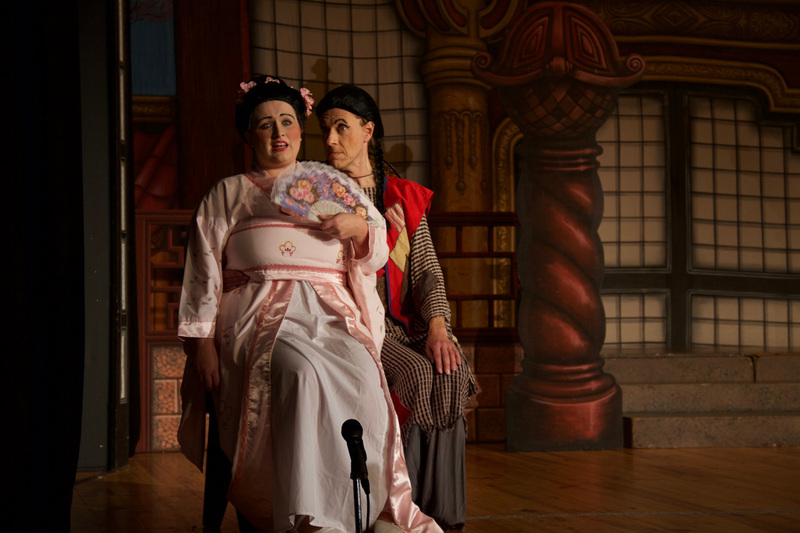 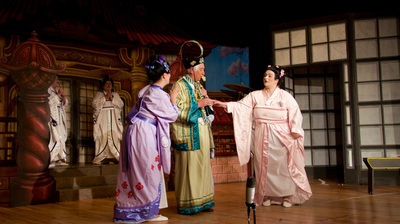 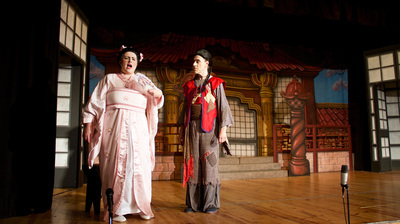 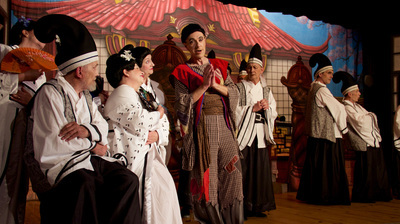 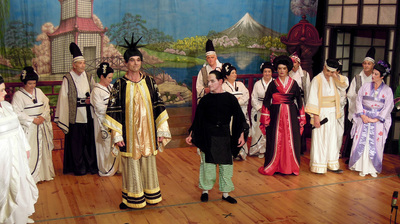 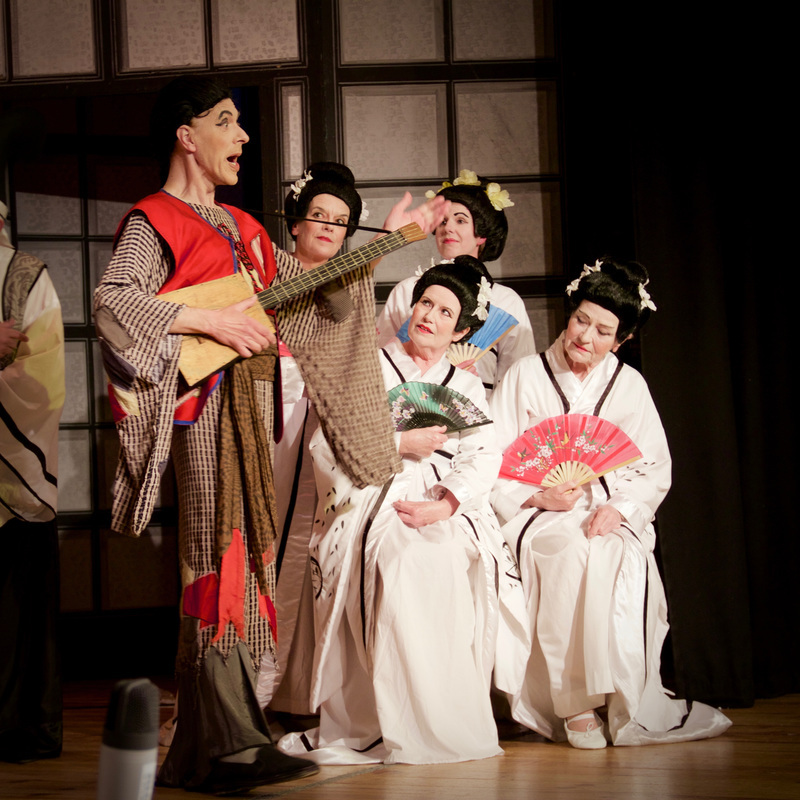 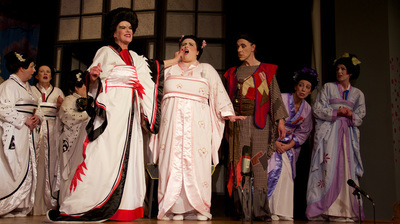 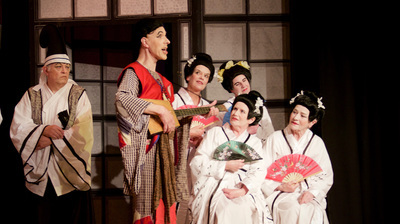 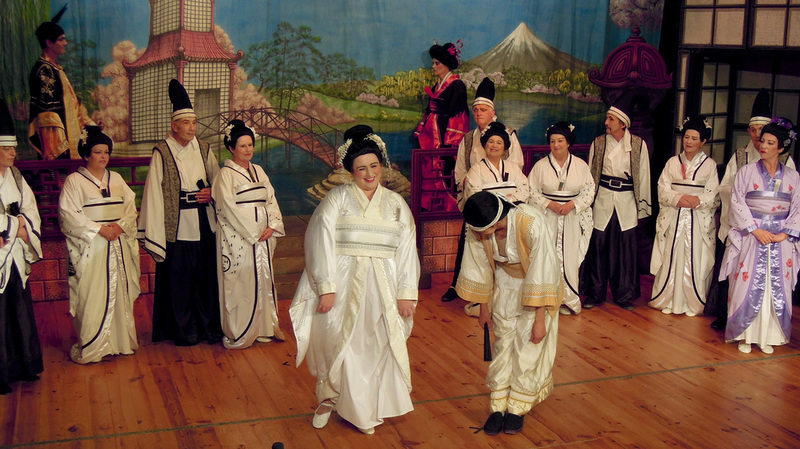 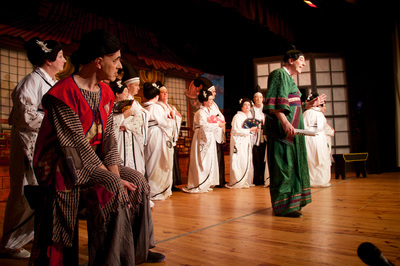 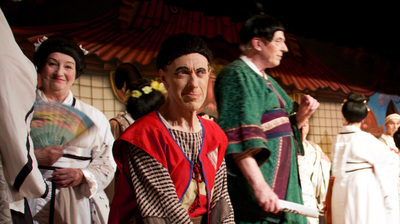 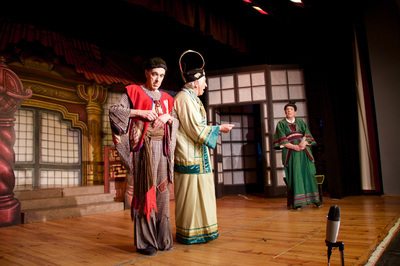 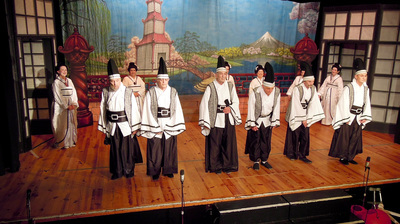 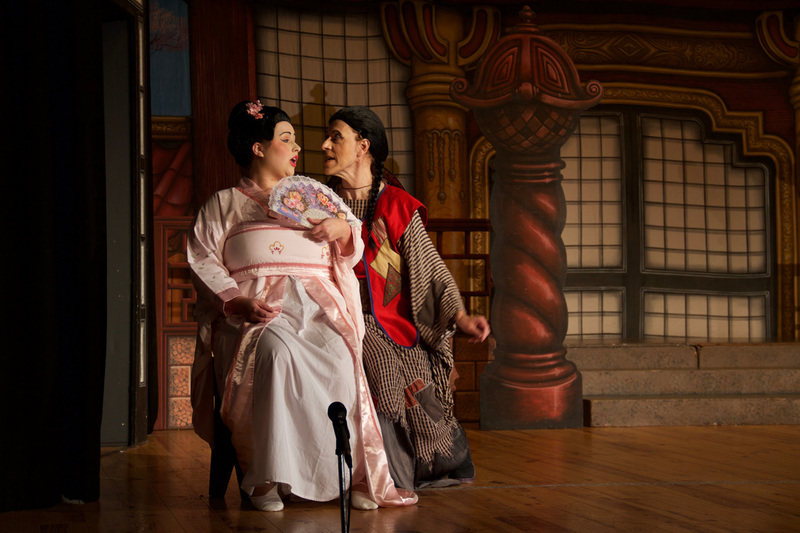 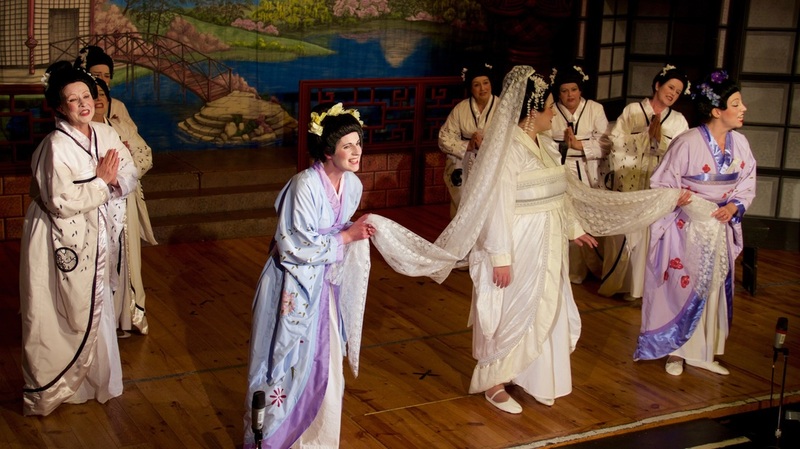 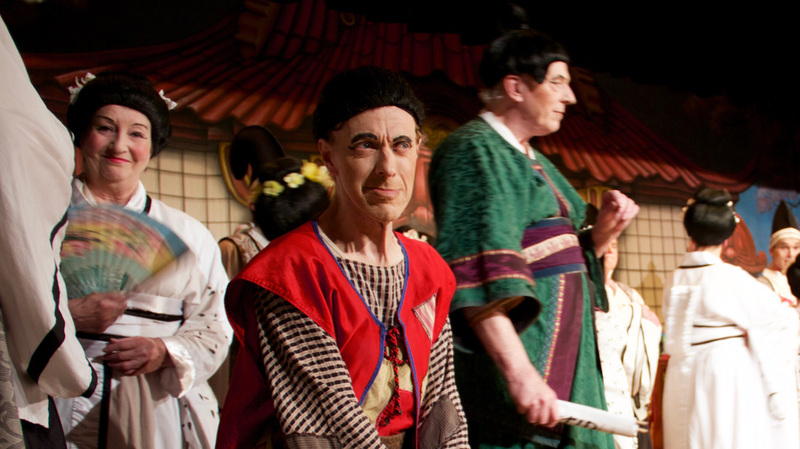 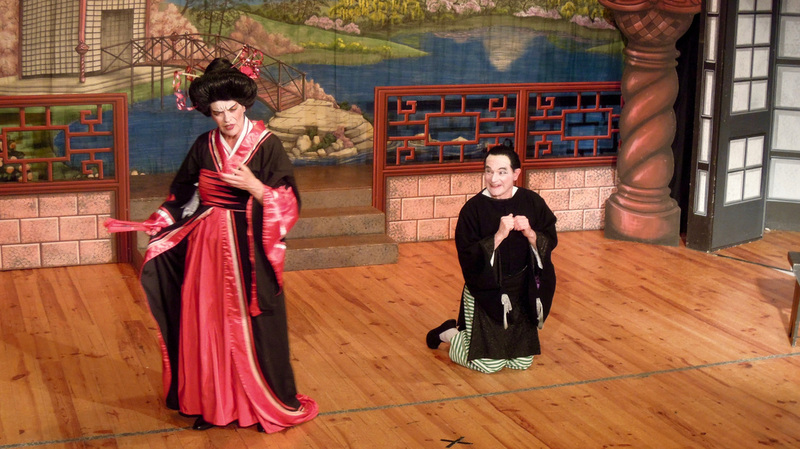 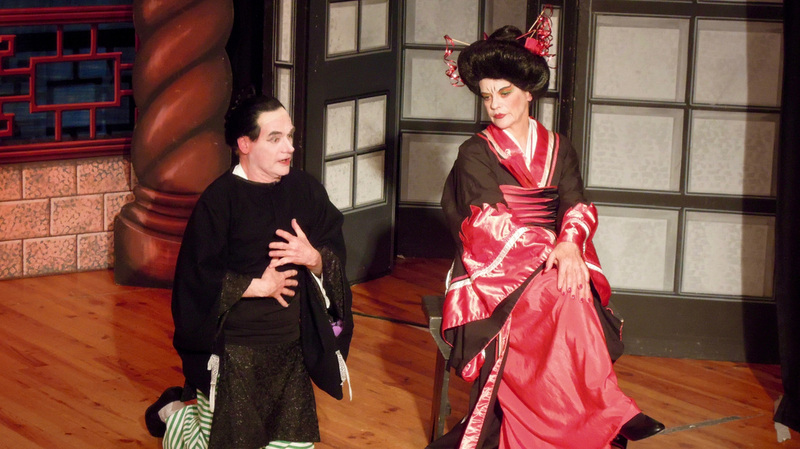 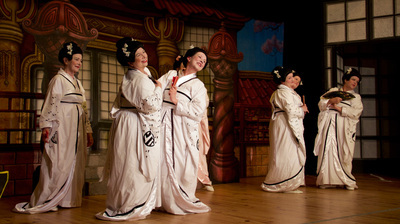 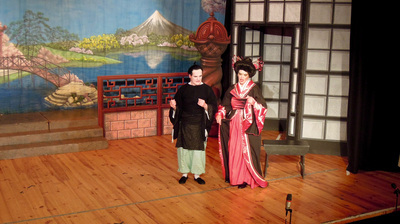 Sarah Cuff gave a strong performance as Katisha and Jeremy Martin played The Mikado. The band was excellent, well led by MD Owain Jones, and the lighting and sound were well planned and executed. The costumes were beautiful and the scenery was perfect. Shame the scenery supplier was not given a credit in the programme, however I did recognise the artist who created it! The pace of the show was a little slow but, again, this was the first performance and I am sure it tightened up for the remainder of the run. Overall an entertaining production of a much loved, perennial, G & S operetta. Well done.